This is an entry from “We of Johann Christoph Nuffer, also known as: Neuffer, Nufer, Neufer,” The book was published in April 1990 by Dabco Printing and Binding Co in Roy, Utah. “The castle ruins of Hohen-Neuffen are the largest in the Schwabian Alps and some of the most attractive. “The approach to Hohen-Neuffen was still difficult up to 100 years ago, but this did not discourage romantic young people of the surrounding villages nor students from Teubingen from visiting the ruins. In the 1860’s and 1870’s the authorities provided easier access to it. “Because former residents of the villages had been carting away the stones in their oxcarts for cheap building material, the entire area is now protected as a memorial. “The mighty corner towers of Hohen-Neuffen originated either under Duke Ulrich, who spent 10,700 guilder on the fortress between 1543 – 1550 or more probably were built by Duke Christoph who put 16,386 guilder into the project up to the year 1562. “The towers served as protective towers flanking the outer walls and ramparts. 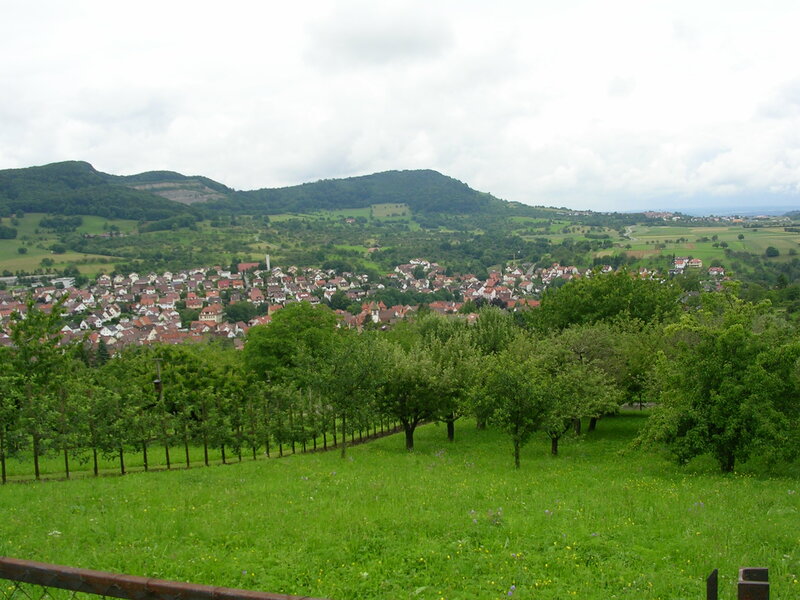 “At the foot of the hill are the villages of Neuffen, Linsenhofen and Frickenhausen. In the distance is Nuertingen on the Neckar. On a clear day the Katzenbuchel (200 ft mtn) is visible in the Odenwald (Oden forest), as are other landmarks. From the bastion is a panorama of the surrounding scenes – Neuffen with the Martinskirche (St. Martins Church) and the quarry of the Nuertingen cement works. “Returning to the courtyard of the castle, next to the cistern on the east into which flowed the rain water from the roofs, is an embossed picture of Eduart Paulus who is credited with much of the research and preservation of the Hohen-Neuffen. According to him, the Hohen-Neuffen was the residence of Theodorick the Great, but this is merely his opinion and has no basis in fact according to Dr. Weinland in his treatise about the area. “It is known that Duke Ludwig (1568 – 1593) built the Ludwig’s bastion. “Although it was besieged many times, it was never conquered. “Earliest findings in the castle and surrounding areas include stone ax, skull and skeletal remains, shards, etc. of the stone age; and bronzes of swords, etc. of the bronze age. 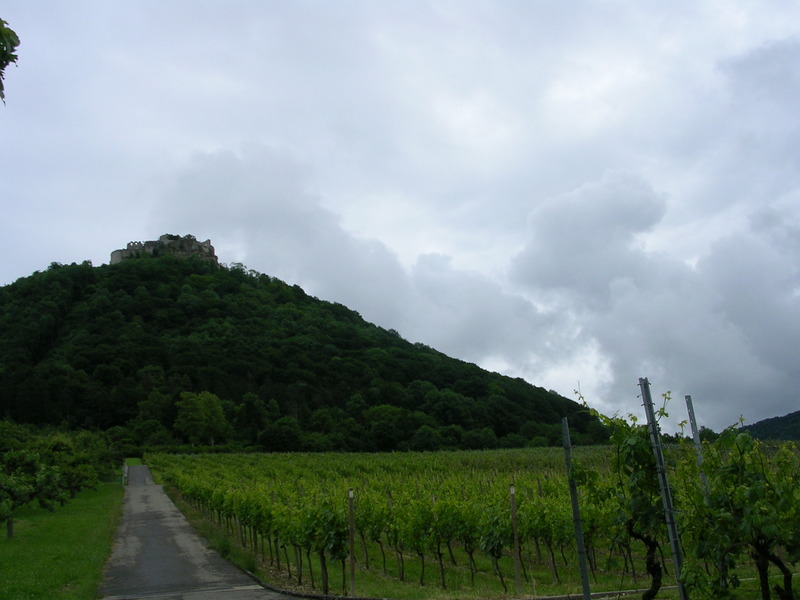 “The first citadel or stronghold of the mountain above Neuffen was probably there about 1100. 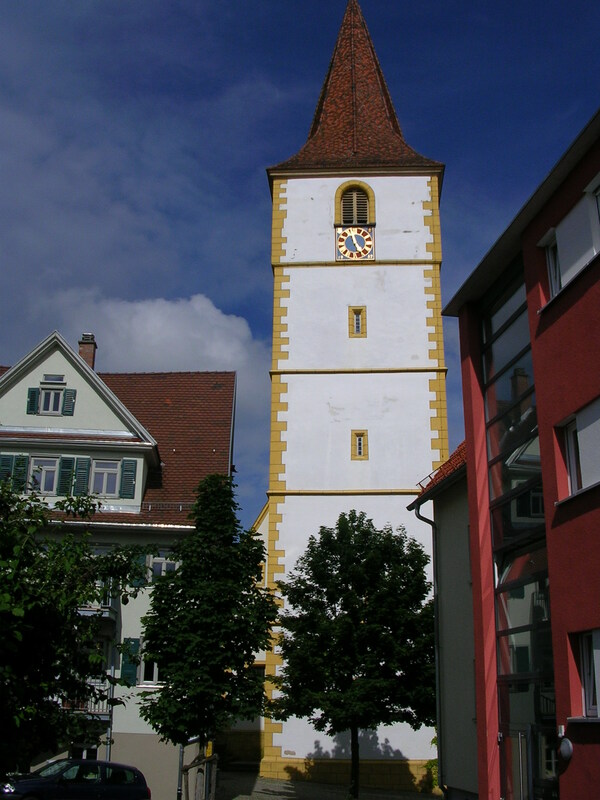 The first authentic occupant or owner was Count Manegolt of Sulmetingen, County Biberach. 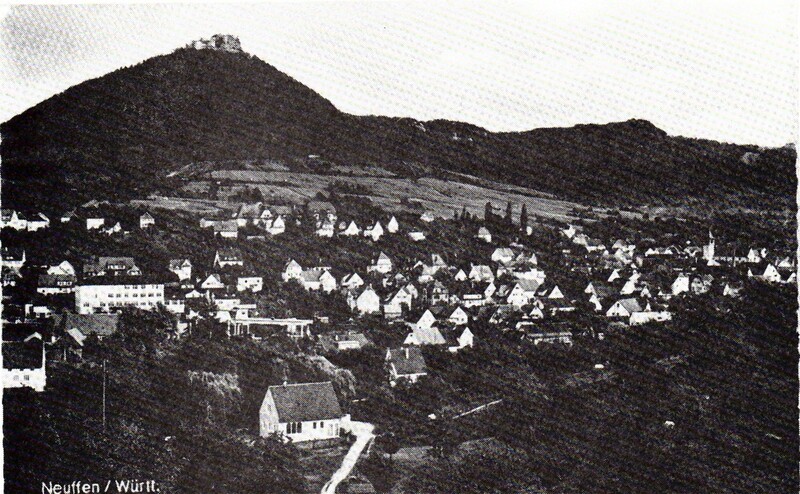 Presumably by the purchase from his father-in-law, Count Egino von Erach, he was able to acquire the surrounding villages of Balzholz, Beuren, Grossbettlingen and Linsenhofen. “The first recorded mention of the Hohen-Neuffen is in 1198 in which the free nobles of Neuffen were named as occupants. (There are detailed descriptions of their coats of arms. “As lower adherents to the Kaiser of the house of Hohenstaufen, the Lords Neuffen played important political roles in the empire. Heinrich I of Neuffen accompanied the 16 year old King Friederich II from Italy to Swabia. Berthold II was the king’s councilor from 1212 to 1216 and from 1217 to 1224 he was Bishop von Brixon. The brothers Heinrich and Albert von Neuffen took part in the crusade of Friederich II. “The 13th century was an especially high point. Gottfried von Neuffen was a noted Minnesinger (Minstrel) from 1230 – 1250. The Neuffens were on the side of the younger King Heinrich IV on his revolt against his father Kaiser Friedrich II. As his troops were first besieged in 1235, Heinrich von Neuffen and his son Gootfried the minnesinger were among the captives. “By the end of the 13th century the entire domain had gone to the lords von Weinsburg through marriage and purchase. In 1301 Konrad von Weinsberg, husband of Luitgard von Neuffen, (the last Neuffen heiress) sold it to Count Eberhard I of Wurttemberg for 8,500 marks. 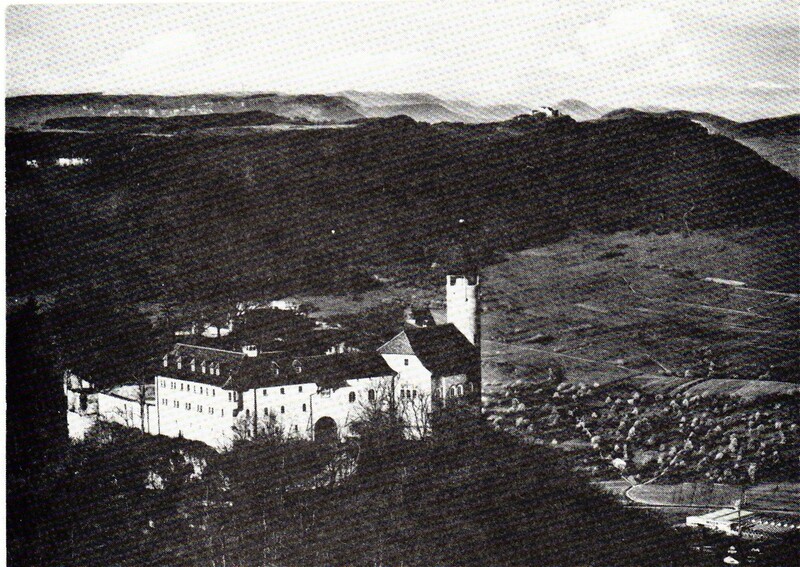 “From 1361 to 1363 and from 1365 to 1366 Hohen-Neuffen was the home of Count Ulrich IV von Wurttemberg. He named Sir Hans Spaeth von Salzburg as first commandant of Hohen-Neuffen. In 1512 he attacked Abbon Georg Fischer von Zweifalten over a dispute. “Because of his quarrel with the Confederation of Schwabia, Ulrich had to flee. His wife Sabina, who had left him, received the Hohen-Neuffen for herself and her children Anna and Christoph, and through war debts of the Confederation the fortress because an Austrian possession. “After a 15 year exile, Count Ulrich again succeeded in acquiring the Hohen-Neuffen which was the last stronghold to open its door to him. “When in 1546 the Duke Alba, at the behest of the Kaiser, came to Wurttemberg, Count Ulrich once again had to flee, but he regained his property in 1547. It met with disaster in 1549 when lightning struck the powder magazine and was again repaired. His successor was Count Fredrich I. “At the beginning of the 30 Years War in 1618 the business of reinforcing, provisioning and manning the fortress became vital. After the defeat of Noerdlingen in 1634, Wurttemberg was overrun by the Kaiser’s troops. Hohen-Neuffen was the last stronghold. 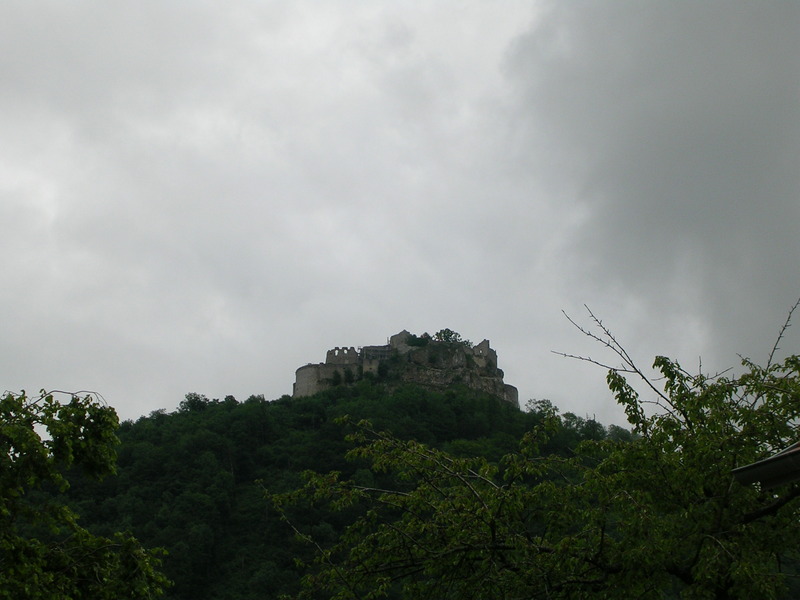 After some trickery, the fortress was given back in 1639 to Lord Eberhard III. A salvo of cannons from the castle announced the close of the terrible war in 1648. Repairs after the war were very slow. “In 1730 King Friederich I of Prussia with his son the crown-prince visited the Hohen-Neuffen. In 1733 Count Karl Alexander wanted to modernize it after the fashion of the French fortresses, with the help of engineering specialists. After his death the work continued for a time, but was soon discontinued. The unfinished portions deteriorated rapidly because no one seemed to be concerned. After Karl Alexander’s death his financier, the hated Jew Suess Oppenheimer, was apprehended. “Karl Alexander’s successor, Count Karl Eugen, showed some interest in rebuilding, but the work did not continue for long. By 1741 the chapel fell in and was allowed to remain so, since the estimated cost of repairs of 2,374 guilder was not available. “A number of political prisoners had been quartered in Hohen-Neuffen during Karl Eugen’s reign. His successor, County Ludwig Eugen, received a report from his commandant in 1793 stating that nothing noteworthy had occurred in Hohen-Neuffen. The county replied that he was happy to hear that nothing else had fallen in. “Napoleon’s troops paid the fortress little attention. In 1796 it was decided by the legislative assembly that because of more urgent need of funds, none was to be used for the maintenance of the Hohen-Neuffen. The French congress ordered it to be demolished. The villagers began to take away stones and tile with which entire houses were said to have been built. “World War II saw the ruins used as an observation post by the air force and it was bombarded by American troops at their entry in 1945 and they in turn were fired upon by the town of Neuffen. However, the hall and knights chamber were reconditioned. “In 1948 at a meeting of the cabinet of South Baden, Wurttemberg-Baden, and Wurttemberg-Hoenzollern, the Hohen-Neuffen was declared to be a ruin. Since 1957 American archaeologists have been interested in the Hohen-Neuffen. “There are many stories and legends about the Hohen-Neuffen most of which are untrue. The above is probably the most authentic abridgement of the available written history. “There are persistent stories of our ancestors, the Neuffers, occupying the castle, most of them arising from the fact that several occupants had the name or title of van Neuffen. However, it should be noted that while von is a German title its derivation comes from its literal meaning “from”. Therefore, von Neuffen is not necessarily a name but merely means “from Neuffen”. It is possible that some of the occupants were related to us. However, there is no direct evidence of this fact. I had another person e-mail me this week attacking that I had the wrong spelling of my family line: Nuffer. I am pretty sure I have my line correct because it shows on all legal documents, tombstones, and everything else I have seen. I know some of the other family have changed their names to other variations thinking it is more correct. I don’t really care to argue or dispute it, my direct line in the United States is not in question, nor is it in Germany for the first few generations before or after our family left. Where the variations go before that are upon the spelling of an author and the spelling of names were not standardized. Another entry from “We of Johann Christoph Nuffer, also known as: Neuffer, Nufer, Neufer,” The book was published in April 1990 by Dabco Printing and Binding Co in Roy, Utah. I will quote from the book itself. “The name Neuffer, Nuffer and its many forms is of Celtic Origin and later became an Alemann surname. “The Celt’s were barbarian tribes which occupied Southwestern Germany from at least the late 6th century B.C.. They were remarkable for their height, muscularity and fair coloring. Their basic economy was mixed farming. They were noted for their high spirits and love of war and excitement generally. They were hospitable, fond of feasting, drinking and quarreling, and incapable of prolonged concerted action. They loved art and greatly prized music and many forms of oral literary composition. (Encyclopedia Britannica). “The Alemanni or Alamanni were a loosely knit confederation of Germany tribes who were first mentioned in connection with a Roman attack on them in 213 A.D.. They were originally composed of fragments of several Germanic peoples. They had no central government and only joined forces when it was necessary for their defense. Their language became the High German Dialects used in the Southwesternmost part of the German speech area. Modern alemannic dialects include Swiss German, Alsatian and the German dialects spoken in Liechtenstein and the extreme western part of Austria. (Encyclopedia Britannica). “This is probably a major contributor of the Swabian dialect that our ancestors and the current population of Wurttemberg speak. It is significantly different from the modern High German. “The German pronunciation of the name is as follows: Nuffer = Noofa oo as in book, short a. The above is only an approximation of the u sound since there is no sound in the English language that exactly duplicates the German u in this case. Neuffer = Noifa, oi as oy in boy, short a. Nufer = Newfa. When a name ends in er the r is dropped. “The family name may have been taken from the town of Neuffen. However, this is not certain as it appeared in several areas at about the same time. This is about the time of the first written records in that part of Germany. Since it is apparent that the name preceded the first records it becomes impossible to trace its exact origin. “Today in Germany the Family Neuffer is the largest and most prominent of the different Neuffer, Nuffer, etc. families and Nuffer is the second. 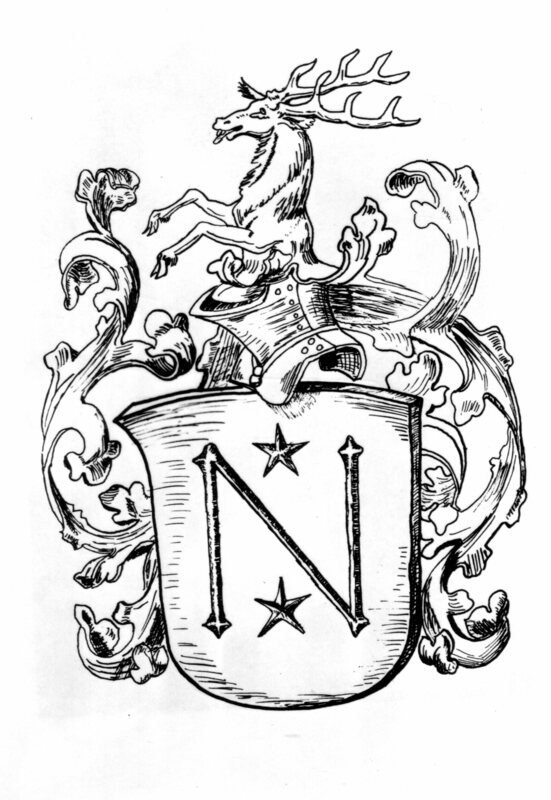 There have been many other spellings of the name such as Nifer, Neifer, Neiffer, Nyfer, Neyfer, Neufer, Nufer, Nufer, Nuofer, Nuover, Nuber, Nuffer, and others. “Our family came from Neuffen and spelled their name Nuffer for the last 2 generations prior to emigrating and Nufer for 3 generations before that. Prior to the early 1700’s we have no positively accurate genealogical connections but it appears that we are connected to the Neuffer family. “Since coming to America most of the family have kept the name as Nuffer but some members have changed it to Neuffer or Nufer. Given the fact that the name has changed several times over the history in Germany it cannot be said that there is such a thing as “the” correct spelling. “It is interesting to note that in Germany today if you find a community with Neuffers in it you will seldom find any Nuffers there and vs. In the town of Neuffen which is supposedly the source of the Neuffer name there are no Neuffers living there, only Nuffers. There is no record of any Neuffers having been born there. There are records however of Neuffers having lived there for short periods as Government or Church officials. “There is no doubt that we can bear this name with pride and dignity when we understand the noble origins and the distrinction with which our forbearers have carried it. Included with this explanation regarding the Nuffer name, there is also a letter from W. Peter Nuffer of Richfield, Utah dated 4 January 1990 to Lloyd Neuffer of Ogden, Utah. This letter included an editors note: “Because of Peter’s wide experience, while living and working in Germany, in searching original records and talking to many people carrying the different forms of the Neuffer name, he was appointed, at the Nuffer family reunion, in 1988, to determine the proper spelling of the name. His opinion, contained in his letter, was that the spelling used during life should be used. An attempt to follow this idea was used in compiling this family history. Here are the contents of the letter. “After researching and thinking more about the subject I think it would be a mistake to spell Johann Christoph’s name Neuffer on the cover of the book. I fear it would bring considerable criticism to you and may weaken the authenticity of the book. Expecially since any serious researcher would not be able to find convincing evidence to favor the spelling Neuffer in relation to Johann Christoph. “You say that you have seen the Neuffer spelling on Logan Temple records. I have not been able to locate that, in fact enclosed you will find a copy of the Logan Temple Index card which shows the spelling as Nuffer. On his birth and marriage records in Neuffen the name is spelled Nuffer. (See enclosed copy of the Neuffer parish records). 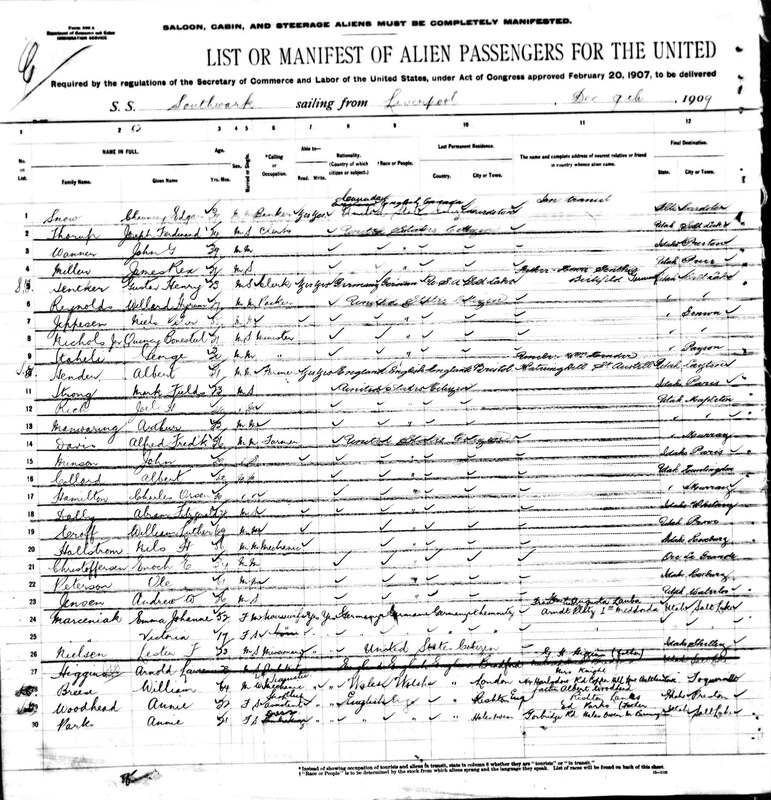 On the U.S. immigration records and the Wurttemberg emigration records it is also shown as Nuffer. (see enclosed emigration index). “You mentioned that the researcher you hired spelled it Neuffer. This is the case only on the pedigree chart. On the family group sheets it is spelled Nuffer. I asked some researchers in the Salt Lake Family History Center why a researcher would have done this when the parish records that they used were clearly Nuffer. They said that sometimes a researcher will use the same spelling all through a pedigree chart to maintain consistency even if the spelling is different for some individuals. They said that this is especially true if it is the way the patron spells their name and if they indicate some sensitivity about the spelling. They said a pedigree chart is only for convenience and is not considered an official document as a family group sheet is. “As I have said before I have no hang up as to how anyone spells their name. But I do feel strongly that when you use an individuals name such as Johann Christoph Nuffer it should be spelled the way he spelled it in life. “Enclosed are some additional and updated sheets and a map for the book. Frieda wrote the following story about Christmas in Germany. December 1901. This would be the last Christmas with their father (Otto was not born at this time). Frieda Andra said, “Christmas in Germany was a very joyous time. We have three days of celebration, dancing, singing, and going to Church. They really enjoy themselves. Every State has a different custom in celebrating Christ’s birthday. They even bake different cakes and call their cakes different names. Names like…Mo, mstrriseal, Hutzelbrot, Kletzenbrot, Kloben, Zwiebelkuchen, and Lebkuchen. Where I came from, we called it Stollen. My mother would bake about four or five because she would take them to the bakery and they baked them in their big ovens. There were many inspiring programs too, in our Church. In many places the people portrayed the Birth of Christ, all in person. When Christmas came, we were really inspired with a Spirit of Holiness. One night when I was about eight years old, a knock came to the door. I opened the door and there stood St. Ruperecht. I was so scared. He asked me if I had been a good girl. I knew I hadn’t been, so I said, “I will be good, St Ruperecht,” and I said my little prayer that mother had taught me. He gave me a switch with his Rude, then looked for the other children, but could not see them as one was under the sofa, one behind the sewing machine, and my little sister was behind mother and was so scared that she began to cry. Then he got my brother Walter out from under the sofa and Willie came from behind the sewing machine and gave them a licking. He asked all kinds of questions to see if we had learned anything. Then we knelt down before him and said our Prayer. It went like this: “Oh du heiliger fromer Christ while fanta Jam Gaburto Stag ift, Da ift aur Ervan ndait umd bright bai allan Menshen froje Zait.” Then he promised us, if we would be good children, he’d see to it that we got some nice gifts for Christmas. He left and we danced and clapped our hands for joy, it was really nice, a spirit of joy and happiness was in our house and in us too. On the Night before Christmas, we all had our baths, and then early on Christmas Day we got up and saw what the Christ Child had brought us. My! The tree was loaded with cookies, nuts, candles, and apples. It was, indeed, beautiful Lebkuchen in forms of all kinds of shapes hung on the tree. We would always get Marziban (that’s candy) for Christmas. It’s delicious. We all got one toy and clothes also. Clothing was the main thing. We all sang. Stille Nacht, Heilige Nacht (Silent Night, Holy Night). Tannenbaum, O Tannenbaum (Oh Christmas Tree, Oh Christmas Tree) and O du frohlicke o dufulige. Then we sat down and had Stollen and a hot drink for breakfast. In General, it was a most happy day for us children. Then we would go sleigh riding as we usually got a new sleigh for Christmas because Papa had made them himself. We called it Kasehitchla, and it came down the hill as fast as the store one did. We lived by Aunt Taute Auguste, so my Cousin Arthur was among us too. Aunt Auguste was a very dear woman. She had a bad husband who would drink and come home and beat his wife and son until they were black and blue. His name was Lippman. He disappeared while Hitler was in power. 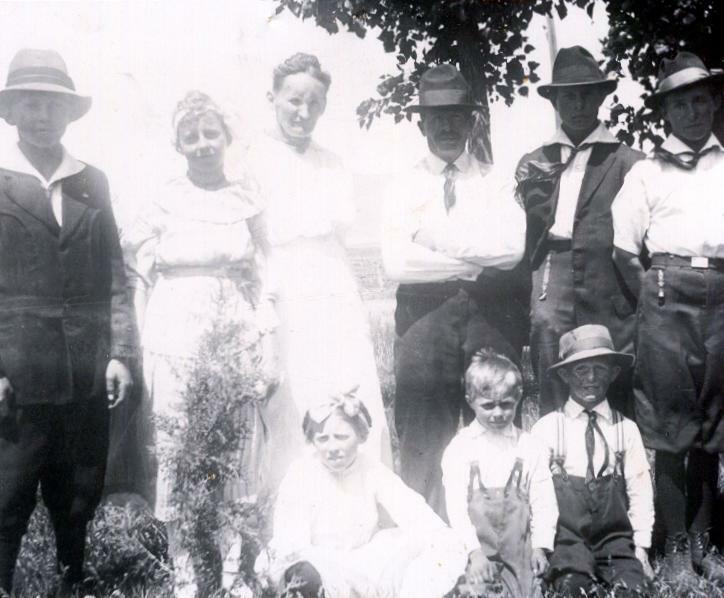 All of them are dead now, Aunt Martha, Uncle Richard Givich, Aunt Bertha and Uncle Fritz Kamprath, Robert and his wife are gone long ago, Tante Auguste. These were sisters and brothers of my mother. Robert Knauke was a brother to my mother. We were very happy in the Old Country. We had such very nice feast (celebrations): Osteria, Pfuigotat Kirwest, Erute, Fest, Christmas, New Year. Each takes three days to celebrate. Then they bake the best cakes, drink and eat for three days, dance and be merry. I need to give some background before I post this journal. 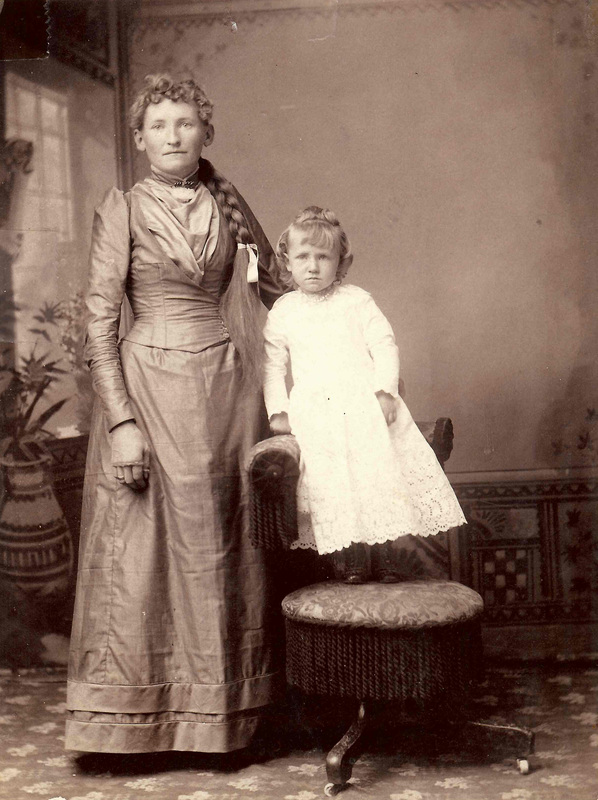 The past few weeks I have posted some stories of Theodor & Christiana Andra. 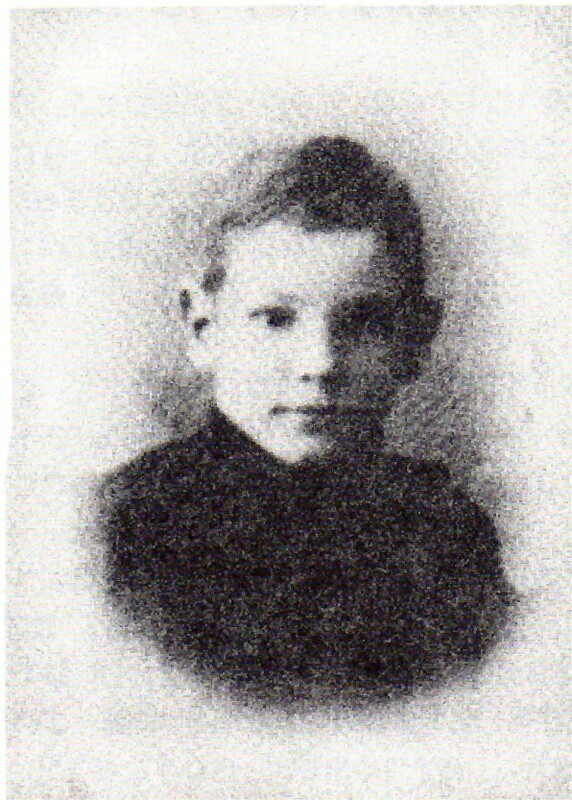 As the stories relate, Theodor died in 1902 due to a quarry accident. 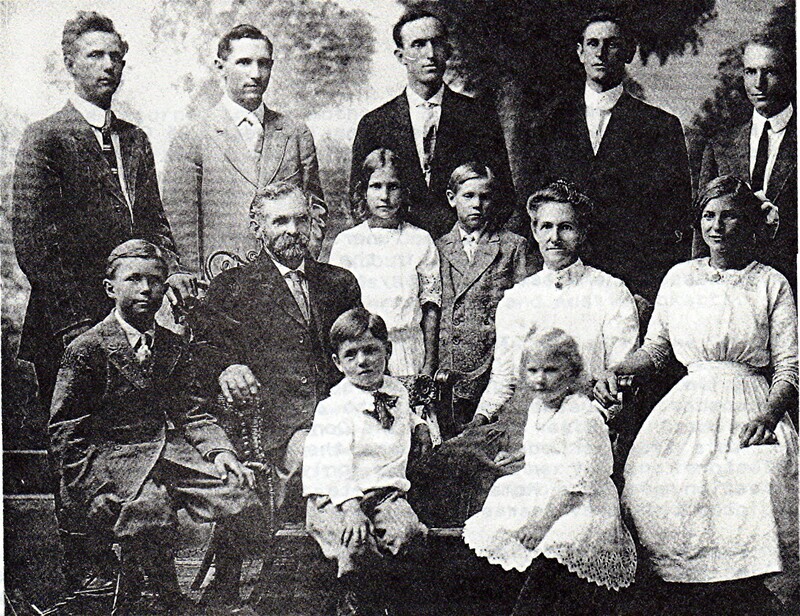 Christiana and the children converted to Mormonism and the family moved to Utah. 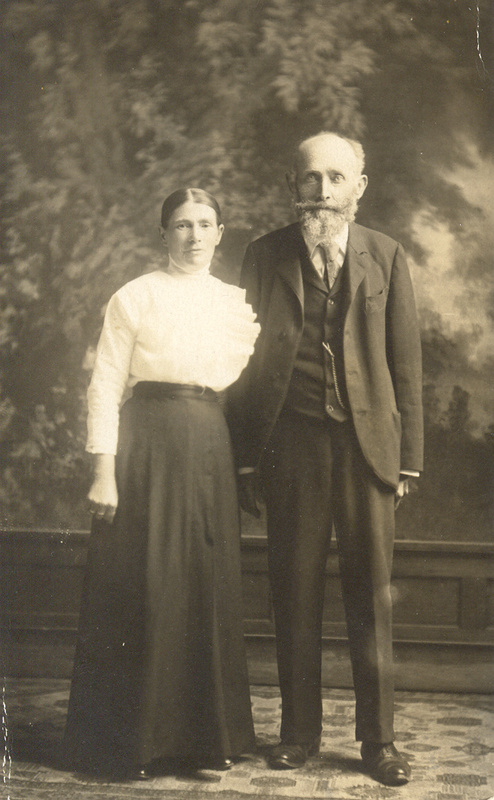 After being in Utah for a few years, she met and married a widower, John Wendel on 22 May 1914 in the Salt Lake City Temple. John became a father to her children who were teenagers. William Fredrick Andra, the middle born knew him toward the end of his teenage years in this home. Johann Wendel was born 27 September 1856 in Wasserberndorf, Mittlefranken, Bavaria and died 20 January 1930 in Salt Lake City, Utah. 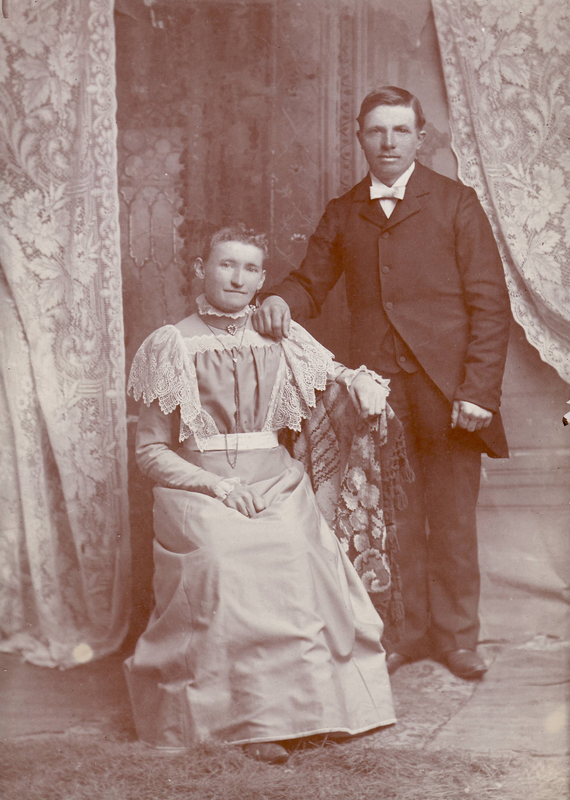 He married Elisabeth Streckfuss 19 October 1880 in Wasserberndorf. 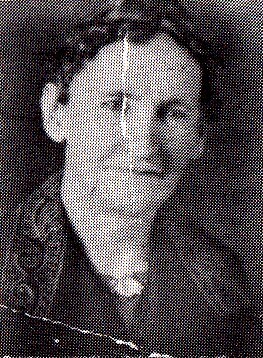 Elisabeth was born 21 February 1850 in Buchheim, Mittlefranken, Bavaria and died 31 August 1913 in Farmers Ward, Salt Lake, Utah. Christiana Wilhelmina (going by Mina in Utah) was born 24 October 1869 in Radebuel, Dresden, Saxony and died 25 December 1957 in Salt Lake City. PREFACE This Grandpa Wendel is a Grandpa to all his living descendants in the year 1978. The younger descendants may have to put 2 or 3 “greats” before the “Grandpa”, but he is indeed a Grandpa to all of us. 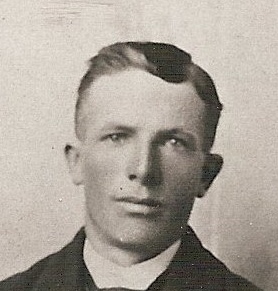 Grandpa John Wendel was born September 27, 1856. He married Elizabeth Streckfuss on September 17, 1880, lacking ten days of being age 24. He joined the Church in the Nuremberg Branch on October 4, 1902, just past his 46th birthday. He emigrated with his wife to Salt Lake City, arriving here in August 1905 — not quite 49 years old. His dear wife was killed by a car in Aug. 1913. when he was almost 57 years old. He was in the Church a few months over 19 years when he was called on a Mission to his Native Land of Germany — a few months past the age of 65. He had re-married to Wilhelmina Christiana Knauke on the 22 May 1914 at the age of 57. He died in January 1930, a few months past the age of 73. This Missionary Journal is written in the Gothic German handwriting and in the German Language. The average American missionary who has served a mission to Germany has not learned to read this Gothic German handwriting. Ursula Hilbert Wendel, an emigrant from Germany, the wife of John A. Wendel, a grandson to Grandpa Wendel, was able to read this journal. Uncle Leonard Michael Wendel brought this journal to Ursula about 1966 or 1967. Ursula’s children were quite small at the time and she had the constant care of her father and part of the time her father-in law. 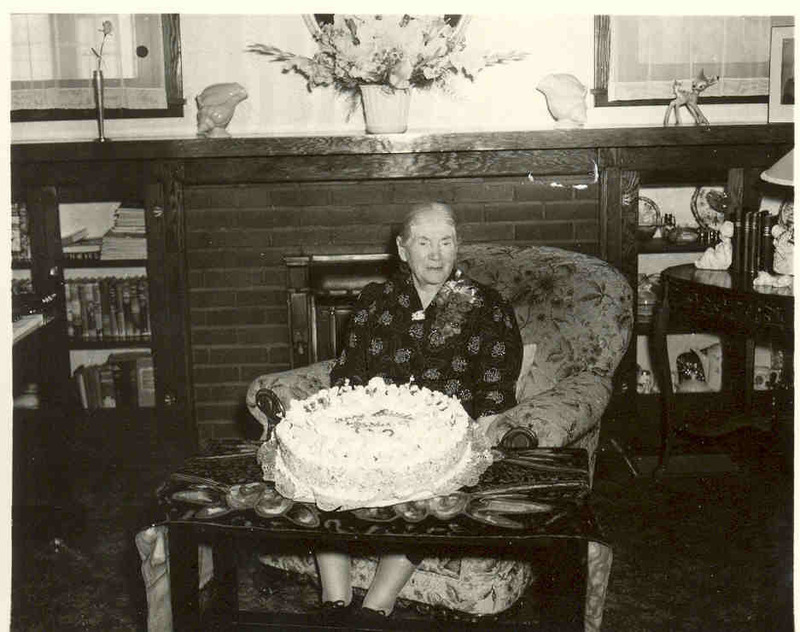 Consequently she was unable to translate the journal as rapidly as Uncle Leonard had hoped, because Uncle Leonard had desired that his oldest grandson should be given the journal, he requested his grandson, John Richard Wendel go to Ursula’s home and get the journal. At the Grave side of Leonard Fredrick Wendel in early June 1977 Pearl Wendel, a sister-in-law to Ursula approached John Richard Wendel and asked him to please bring the journal to the Wendel Family Reunion in July 1977, so that Ursula may finish the translation of it. This he did. God moves in a mysterious way His wonders to perform! At this time Ursula’s oldest son Ronald was on a Mission. So, to help out financially, Ursula obtained a job with one of the schools in Bountiful to help with the hot lunch program. In January and February 1978, Ursula was forced to quit her job and spend much time in bed because of trouble with her legs. During this time she was able to complete the translation of Grandpa’s Missionary Journal. 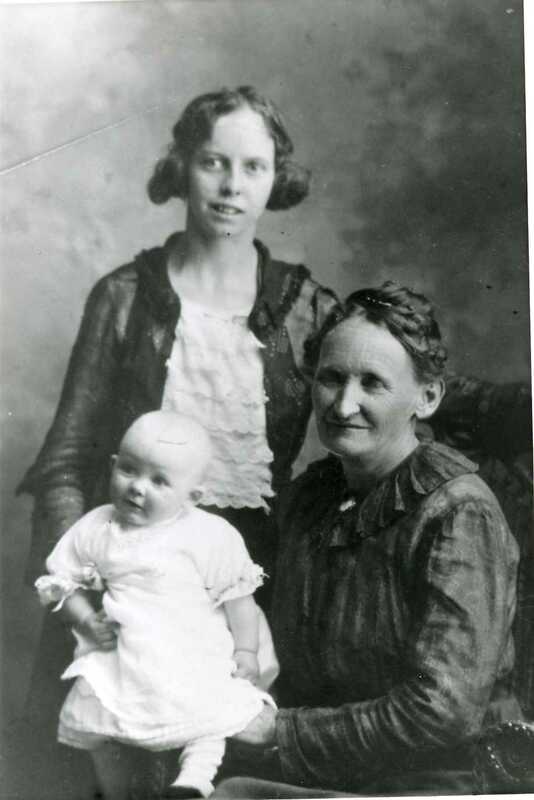 She then gave the completed work to Pearl Wendel, who had volunteered to type it and have copies made for as many of the descendants of Grandpa Wendel who desired them. 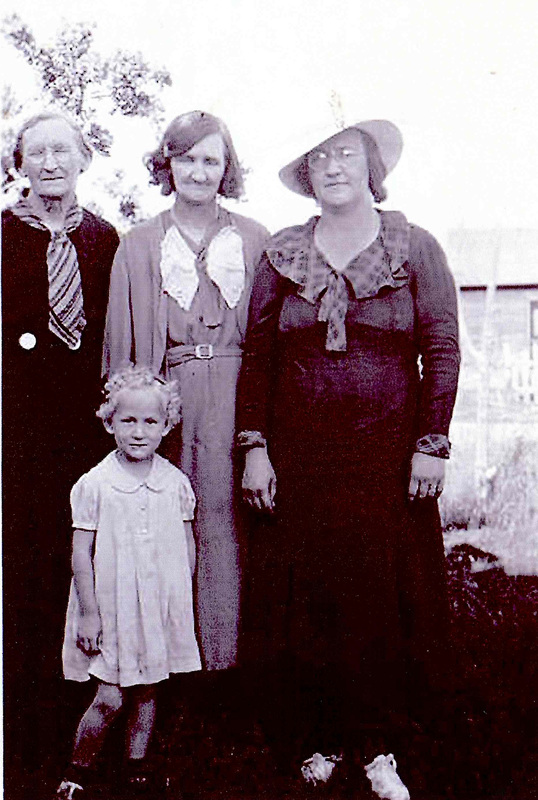 This Journal should be of particular interest to the families in the Leonard Michael Wendel Line, because one of the first people whom Grandpa called on was the father of Frieda Johanna Neuner (Uncle Leonard’s wife). He also mentions finding Fredrick Kohles completely blind. 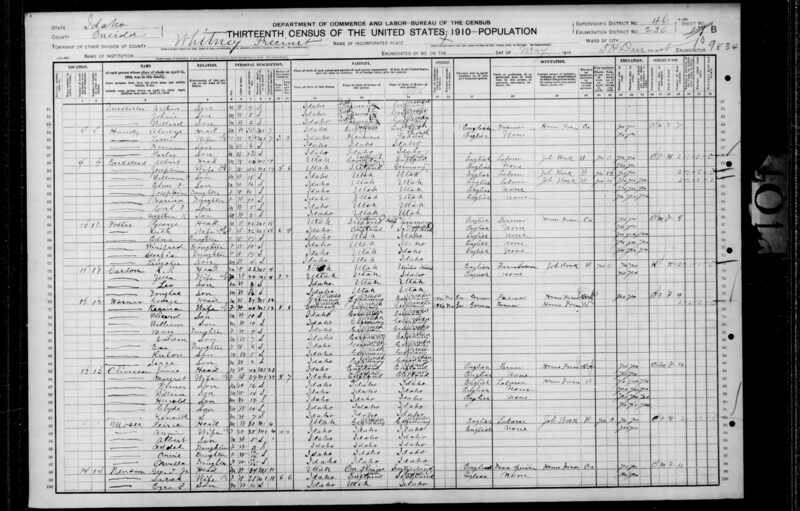 I tried to find how he fit into the Kohles line, but from the Genealogy sheets which I have I was unable to fit him in. He may have been a cousin of Grandpa’s. I, as typist, have tried to put the translation into the American way of saying things without destroying the real meaning Grandpa meant to say. I have worked very closely with Ursula on this so that the translated Journal will tell the story Grandpa wrote. THE GOLDEN RULE DO UNTO OTHERS AS YOU WANT THEM TO DO UNTO YOU. On January 25. 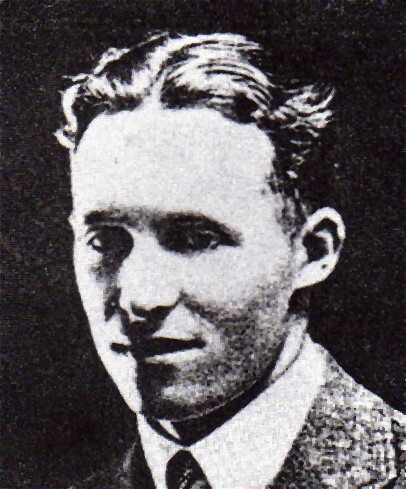 1922. 5:OO P.M. I left Salt Lake City, through Wyoming, Nebraska, Illinois, arrived in Chicago, January 27, 7:OO P.M. sight seeing on the 28th, like Museum, Post Office, Michigan Lake, climbed the highest building and in the evening at 7:OO P.M. on the 28th, leaving for Buffalo. We arrived here on the 29 of Jan. at 4:00 P.M. One hour delay and then on to Montreal, where we arrived Jan. 30 at 8:00 A.M. From Vermillion till Buffalo, we traveled on the big river to Niagara Falls. In Erie we saw a lot of cultivation of grapes. After our passport was inspected by the German Consulate in Montreal and $10.00 paid for, we left on the 30 of Jan. at 12:OO o’clock noon for St. John. We arrived there on the 31st of Jan. at 7:30 A.M.
On February 1st at 11:00 A.M. we got on the ship “Montcalm”. In the afternoon 3:30 P.M. the ship left the Harbor. On Feb. 2nd. 9:OO A.M. we arrived in Halifax, where the boat laid all day and night till 2:OO A.M. and loaded 16,000 barrels of apples, a lot of sugar and cheese. I could hardly believe what such a ship could carry. The boat is 560 feet long and keeps going by oil. The City of Halifax is very mountainous and was covered by snow. On the 3rd of Feb. 1922 at 5:00 A. M. the ship left. Everything is very noble and modern and we are 212 man. in First Class. On Sunday. February 9, 1922. we held Church Service from the Church of England in the Dinning Room. On Feb. 9th, we passed the Coast of Ireland, where the water looks light green compared to the Atlantic Ocean’s dark blue or even black. On Feb. 10th at 3:00 A.M. we arrived in Liverpool. We the German Brothers Pitsch, Pohlmann and I, together with 3 others had to stay here one day, because our Passports haven’t been inspected, by the English Consul. On Feb. 11 at noon, we left the boat, took care of our luggage and at 2:00 P.M. left Liverpool for Grimby Dock, where we arrived at 6:20 P.M. At once we went to the boat for Hamburg, Germany. In the Evening at 7:30 P.M. the ship left and we arrive in Hamburg, Feb, 13th at 8:00 A.M. We stayed in Hotel Stein. The Voyage till Hamburg, Germany, with Passport difficulties, food and tips cost $274.00. In Liverpool, we stayed half an hour in the passenger train, where Apostle Whitney and two other Elders visited us. On Feb. 15th. I saw the Exotic Garden, but because of snow, I didn’t see very much. Then I visited the Volksmuseum (People’s Museum) and there was a lot to see. With a guide, it cost me 6 Marks and 50 Pfennige (cents). In the evening I went to the Bible hour and I liked it very much. Feb. 16th Today I shall study. Feb. 17th At 12:30 P.M. I left Hamburg for Berlin and arrived here at 8:30 P.M. A few good women I met on the train, looked after me. They showed me the way to a lodging and carried my luggage. I met here Brother Stoddard, he is the Conference President. On the 18th of Feb. he sent me to a family, where only the woman is a member of the Church. The first night, I slept in Brother Stoddard’s Lodge Samariter Str. 38. On Sunday the 19th. I visited Sunday School and got invited for Dinner with another Elder. I had a good time. In the Evening, we went to the meeting, where I had to speak for the first time. Afterwards we blessed oil and a sick person. The members were all very good to me. On Feb. 20th It is very cold in the lodge. On Feb. 21st I received word from Swiss that I was transferred to Nuremberg. Tomorrow I shall leave. The name of the sister where I’ll stay is Anders, Guntenerstreet 24. On Feb.22nd at lO:OO A.M., I left for Nuremberg by D Zug (fast Train) thru Wittenberg, Halle, Jena Saaletal (River Saale Valley) up to Lichtenfels, Bramberg and arrived in Nuremberg 8:30 P.M., where Brother Strebel picked me up from the station. He took me right from there to a farewell for Sister Keil and Brother Ludwig. On Feb. 23rd. 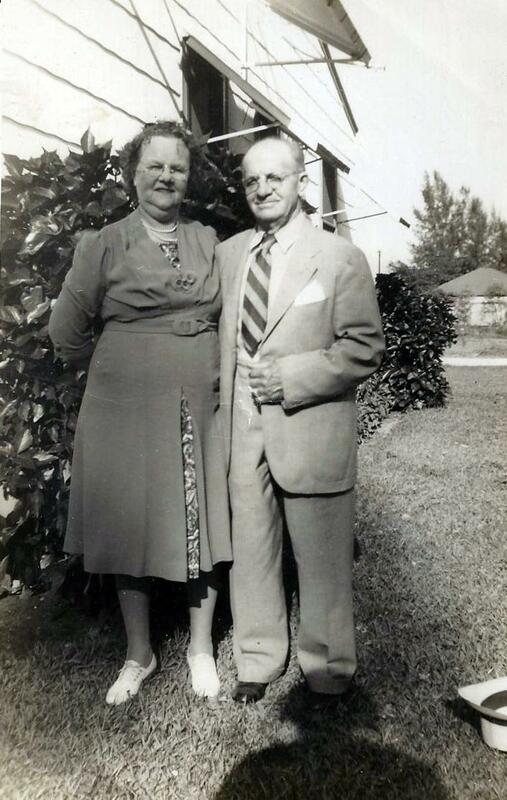 I visited Brother and Sister Adelemann and a family Harold, where I found Friedrich Kohles completely blind. A sad fate. On the 24th. I visited Carl Neuner in Failhof in the poor Hospital. He is very weak, but was very glad when I introduced myself as Father-in-law to his daughter and gave him $10.00 from his Son-in-law. I spoke a long time with him about the Gospel. On the 25th. I visited the Eckardt Hamer family. He recognized me at once, but not his wife. I had a very warm welcome here. Afterwards I made a visit in Birkenwald, where I was strongly welcomed and fed well by the Hartmann family. On the 26th. I went to Sunday School in Nuremberg, Bucherstrasse 90 and noon meeting. They welcomed me good and I had to speak. On the 27th, I went tracting, but had no success. On the 28th of Feb., we have been by Brother and Sister Schneider’s place. On March 1st, I have been in Birkenwald, where I explained the Gospel to Hartmann. 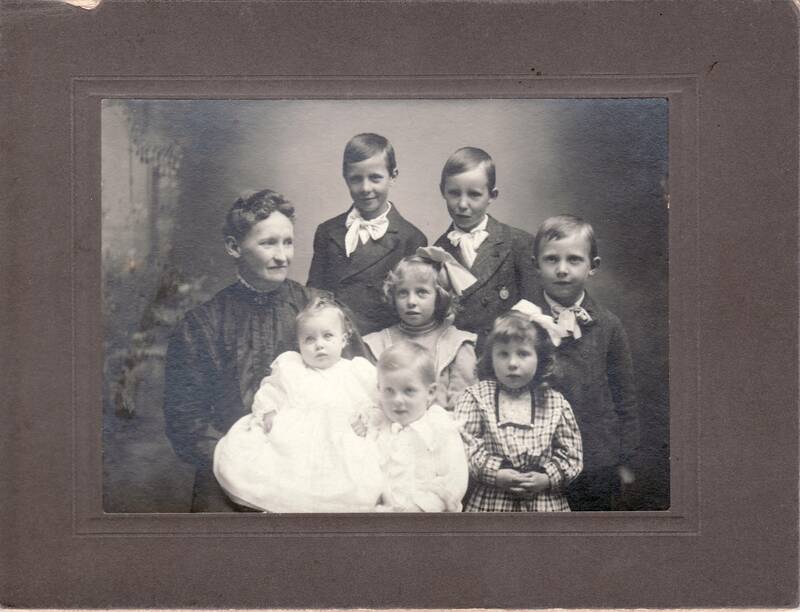 On March 2nd, we have been in Fuerth by Brother and Sister Habermann, and in Feucht with the Dannenfelzer family. On the 1st Brother Strebel and I were in Ziegelstein too, a colonie 2 by Brother Mueller, who was ill.
On the 3rd of March, I have been to Mrs. Hartmann in Birkenwald and Janitor Schwarm and Hass, where I was welcomed friendly. On the 4th, I stayed in bed, and on the 5th, we had Ward Conference. Brother Stoof (Stover) Conference President, from Stuttgart was present and we had four meetings. On March 6th, I visited Mr. Baurner and L. Gruensteidel. I was welcomed good. On the 7th to the 11th, I visited some friends and had opportunity to preach the Gospel and did tracting. On the 12th of March. Sunday School and after that meeting, I went with Sister Saum and wrote some addresses down. I visited then ‘Gg.’ and Kath. Schmidthammer, where I stayed over night. On March 13th, I visited Conrad Hassler, Geutherstr. 1. Here I was welcomed good also. On March 14, 15, and 16th. I was ill and stayed in bed. In the evening on the 16th, I got up from bed and visited Anna Schmied. She is married to a man named Lechner. I didn’t recognize her anymore, with her 35 years she is an old woman. Today March 17th. I received my eviction. Such a dangerous Individual has no right to be in the civilized City of Nuremberg. On the 18th and 19th, I was in bed again. On the 21st, I got up and received another eviction. I visited Walz and Ditsch. Ditsch wanted to convert me. On March, 20th….thru the 23rd, I was in bed. On the 23rd, much snow and wind. Until April 1st, I visited several inactive members. April 2nd, I have been to the meeting and Sister Huber was sustained as a Sunday School Teacher. Yesterday, April 6th, I attended a meeting in the Hercules Veledroon, a very good one, arranged by the inter-National Jehovah Witnesses. The Lesson was: “Can men talk with the dead?” They pointed out, that the dead ones with whom the Spiritualists communicate, are not our dead persons, but the spirits who were cast out of Heaven. “Rev. John 12:4,9” They want to show off and tempt mankind. April 11. I was busy a half a day in the city hall because of my eviction. I made a petition. On April 18. 19t and 20th, I was ill at Brother and Sister Schneider’s. On the 22nd, I went to Frankfurt for Conference. I feel better. I arrived in Frankfurt at 5:00 P.M. I stayed with Brother and Sister Anton Huck, Schillstreet 5, 2nd story. A place where I was welcomed good. Sunday morning — Sunday School and 3:00 P.M. Meeting. Monday from lO:OO A.M. till 3:00 P.M. Missionary meeting. Present were President Balif and President Stoof. Twenty-one men received good instructions how to tract. In the evening at 7:30 P.M. Priesthood Meeting until 10:00 P.M.
On Sunday I had to speak briefly and I mentioned by the way, that I would like to see from our big branches here a compliance for our German Wards in Zion, so that they may receive the blessings of Temple Work with us, and so on. After the meeting President Balif said to me, if I speak again about emigration, I would be released from my mission at once. Now I don’t understand how to reconcile this with my opinion, but I’ll try as much as possible to obey. On Tuesday, we went home, 6:00 P.M. in Munich, in Wuerzburg some hours delay and so we could go and see the city. Twelve of us were from Nuremberg. Brother Strebel, myself and two Sisters Strecker drove home together, but first I came alone. The trip to Frankfurt and back cost 200 Marks. Frankfurt is a beautiful city and I liked it very much. Today, Rain April 28th. I walked all day and visited four friends and explained the Gospel to them. Afterwards I visited 5 astray members, who didn’t want to know anything anymore, because they know already enough. The whole day I didn’t eat anything. So, late in the evening, I visited The Schmidthammer’s, they were just thru eating. They did not invite me, Well, the Gospel creates not all the time friends. On the way back home I wanted to buy something to eat, but all the stores were closed. When I reached home, my landlord, Brother and Sister Strebel had gone to bed already, I went to bed, the first time hungry and I felt very weak, and wished I were home and my mission complete. On the 29th, I bought with Sister Ceder’s help a Fur for my Mina (2nd wife, Wilhelmina Christiana Knauke). Sister Strebel will send it to her. The price is 2600 Marks. Today I received my sanction for my stay until July 15th, and payed 442 Marks for it. Sometimes I feel very sad because people have so very little interest for the Gospel. We have rain again. The weather suits my mood I am in today, May 1st. May 6th. I visited several lukewarm members, and invited them to a special meeting, where they will have to declare if they are for or against the Church, concerning excommunication. May 7th The divorced Mrs. Wieleitner got excommunicated from the Church today because of adultery. President Stoof was here today and we had all day long meetings, where I had to speak too. I administered to Sister Ceder also today because of her headache and blessed a child of Brother and Sister Wieleitner, which received the name of Bruno Wieleitner. The weather is beautiful today and it seems as Spring is coming. May 8. Today Sister Stern’s son Bruno got buried at the Johannis Kirchhof Cemetary. He was a member, fallen away from the Church. The Sermon was given by a Priest. He was 20 years old. (Translator’s note* I guess the son was 20 years old, it is not quite clear, who; Priest or son.) Afterwards I visited some members and friends and talked with a Catholic nurse in the Hospital, about the Gospel but without success. May 9. I visited Mrs. Hartmann’s family Reichel in Birkenwald and bore my Testimony; also to Hempfling and Hefner, where the women were very attentive. May 13th. Today I went to the Cemetery (Sudfriedhof) where a former Co-worker, Work Master Schlegel from Birkenwald is buried. I visited him several times before his death. He associated with the International Bible Investigators and was buried from them also. May 14th. Today was Mothers’ Day. It was appropriately celebrated and. the Mothers received flowers from six girls dressed in white. Brother Dinse remembered the Mission Mothers especially. It was a splendid Sabbath and we had a beautiful time. May 25. In the morning 4:45 A.M. I drove to Steppach (I assume by train the only transportation possible) passed Strullendorf. Till here the fare was 18 Marks, and till Steppach 6 Marks. At noon I visited Gg (Georg) Holler in Pommersfelden the Castle. There was much to see, like wonderful paintings and a Hall that was completely adorned with sea shells, a herd of Deer with antlers, (Steinbocke) and so on. May 24th I moved out from Mullner Street 23, Brother and Sister Strebel and moved in with Fritz Hefner, Peter Henlein Street 25 third floor. May 25 to 26. I stayed over night in Steppach with Lisie Grau. I visited then Mrs. Vogel at the Hutzolmill, then preached the Gospel to the Holler Family afterwards traveled by train to Simmersdorf, paid 2 Marks for the ticket. Then I traveled to Horbach and to Weingartsgreuth, where I went to the Parson’s (Minister’s) Office, and received Genealogy from the Wendel families and paid 20 Marks for it. Then I went back to Weingartsgreuth and preached the Gospel to a family by the name of Kronester and tracted in this town. In Horbach I stayed over night with Blacksmith Master, Matthaeus Rost and preached the Gospel and gave him tracts also. On the 27th. I went on to Wagenroth, where I looked up the minister for Genealogy and received some. Then I asked the Minister “What do you think about the Mormons?” He answered, “Well, you teach the Bible also, but the Bible contains many unclear passages, where one without a leader cannot understand what is said and therefore every Sect interprets it differently.” I wanted to give him tracts, but he refused to take them. Then I rode to Schluesselfeld, paid 3 Marks for the Ticket, from here I went to Ashbach and Wasserberndorf, visited on my way Blacksmith Matthaeus Hassler in Heucholheim; then Vogelsfrieden in Aschbach. In Wasserberndorf I lodged with my godmother. May 28. I went to Wasserberndorf, my birthplace, and I found many changes there, my people and the town itself. Most of the old people are dead and the young ones grew up. May 29. I visited F. Wendel in the Hutzol mill and the old Ritzau and many other acquaintances. On the 30th, I went to Langenberg and Abtswind, where I stayed over night by F. Herrmann, visited the Wendel families in Langenberg and was here well received. On the 31 st of May. I returned and had a long conversation with J. Uhl and also with Mrs. Doctor in Geiselwind. On June 1st, I went to Fuettersee Kleinbirkach and Grossbirkach, Gg. (Georg) Kleinlein accompanied me. We had great joy as well as all others I met. With Mr. Teacher in Grossbirkach, we stayed a longer time and talked about the Gospel. 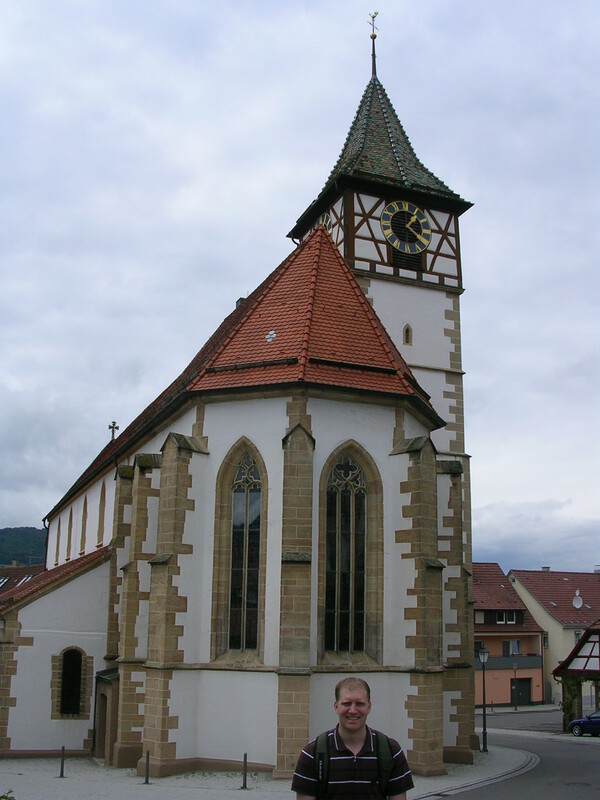 On the 2nd and 3rd, I made several visits in Wasserberndorf and preached the Gospel, but had not much success. I gave the teacher of Wasserberndorf tracts and explained the Gospel to him. On June 5. I was in Church in Fuettersee. At noon Gg. Kleinlein visited me and we talked half the day about the Gospel. What kept him interested, June 6, I was in Burghasslach with H. Dekon for Genealogy and visited F. Paul and conversed with him for a long time about the Gospel. On June 8. I went (by train) with Fritz to Ziegenbach and visited Gg. (Georg) Wendel and there I tried to explain the Gospel. June 9 and 10. I stayed in Breitbach with Martin Kohles. There I met a man from Altenschoenbach and we talked for a long time about the Gospel. His name is K. Lamprecht and he is a Blacksmith. On June 14. I went to Kirchrimbach and Taschendorf to get Family Records and in Taschendorf I had a conversation about the Gospel with the Minister for one hour. He don’t believe in a pre-existance. Furthermore, he could not understand how blessings can result in having a big family (many children). June 17. I went back to Nuremberg. June 18. We had a nice meeting, Brother Stoof gave a good speech. The branch was re-organized because the Branch President, Brother Strebel is emigrating to America (United States). Two Brethren were ordained in the Aaronic Priesthood. I ordained one of them, Brother Schneider, as a Teacher. June 25, Today we had a beautiful meeting in the Forest and Sunday School in Erbanstegen. The Branch from Fuerth was present also. July 6, We had a great Conference July 2nd in Stuttgart, where all the Missionaries from Holland, Swiss, Austria and all Germany were present. We received good instructions and it would be desirable if all the instructions could be followed. About 112 American Missionaries went to Oberammergau (The town for the Famous Passion Play in Germany). Most of the German Missionaries stayed in Stuttgart, probably because of lack of money. I went with Sister Zeter sight-seeing in Stuttgart and I liked it very much. I stayed three days in a Hotel, but it was too expensive; I paid 102 Marks the night. The last two nights I moved to Sister Zeter’s Landlord, which let me stay without any pay. They were real nice people, their name is R. Hald and they live in Strohbergstrasse 36, three stories high in Stuttgart. July 5. We returned to Nuremberg and had there photographic pictures made. July 9. Today the Branch Moegeldorf-Hammer was organized and the first meeting was held 3:00 P.M. In Nuremberg at Sunday School the following brethren from Salt Lake City were present: Brothers H. Rueckert, L. Schobert, Gasser and Little. In the evening we had a beautiful meeting in Nuremberg, and I blessed a child of Sister Buchholzer and gave her the name Bertha Edeltrude Buchholzer. In Stuttgart, I met many friends (acquaintances) from Salt Lake City. The first one I met was the son of Brother Curtis. I stayed there in one room with Brother Glissmeyer (Glissmaier) and saw Brother Pitsch and Brother Pohlmann, The first time again, since we departed from each other in Hamburg. July 13. Today I was at a Catholic funeral. The wife of Mr. H. Popp, a past job-colleague, was buried at the South Cemetary. She was 39 years old. On July l6th, We had some well attended meetings. . In the after noon at 3:00 P.M. I went from here to Moegeldorf with Mr. Hiltmann and his wife to her sister and brother-in-law whose last name was Fink. While there, we had a long conversation about the Gospel. We had a beautiful time. In the morning I visited M. Huegelschaefer and was invited for Dinner, and had opportunity too to explain the Gospel. July 27. This morning I went with the Brethren Dinsi, Schmidt, Karl Weiss to Brother Binder to bless him. He has to go to the “Martha Haus” (Hospital) for a nose operation, because of probable cancer. July 29. Today I went to Fuerth and visited Maria Klein of Holzberndorf. She lives with her daughters, one of them is married and lives in Marien Street 5. She is divorced, but her husband is married again. July 30. I was laying in bed at night and had a toothache and was thinking about something, when suddenly someone called out loud “Hauner” Mr. Wendel. At once I recognized the voice of Woodworker Uhl from the Hutzelmuehle. I thought at once, why is he coming here. He probably came by train and has no night lodge (a place to stay for the night). At once, I jumped out of bed in my room, went to the window where I called out: “What is the matter?” I got no answer. I leaned out of the window and saw nobody. After a few minutes there came a few pedestrians. I turned on the light and it was 10 minutes before one o’clock in the morning. I layed down again. Now, I can understand when people have so many visions. August 6. We had Fastmeeting. We had six meetings on Sunday. One before Sunday School, Brother meeting, Priesthood meeting, Fast meeting, and afterwards a short meeting, where a brother by the name of Foerster got excommunicated, who was against the Church and probably asked for his excommunication. Afterwards we visited Sister Ancon who is ill.
August 12. We drove to Munich for a Sunday School Conference and we arrived there at noon. In the evening we had Priesthood Meeting with President Stoof conducting. There was a Brother by the name of Spengler ordered to come, who was accused of adultery and therefore was to be excommunicated. But because he showed remorse and promised to improve and seriously repent, they forgave him. Sunday, August 13, The Elders fasted for him. We had that Sunday three meetings and returned home in the evening at 9:00 P.M.
August 14th. We visited the Industrial Exhibition and the “Bavaria”. On the 15th, We viewed Starnberg and Schlossberg. It was really nice there. But when we enjoyed the Observatory the most, did we get surprised by a rainstorm and got quite wet. Afterwards in the evening we returned to Munich. It was very cold on the ship and we did freeze very much. On the 16th we drove back to Nuremberg and in the evening we had a meeting too. My hostess (or housewife for renting a room) baked a big Goloph (I guess a cake) for our return, that we enjoyed. Besides, there was a letter waiting for me from my Mina with five dollars in it. On August 19. I went to Reusch to visit my friends there. I had opportunity, a Mrs. Rike Hahn, Stusdamm(?) was in the train who visited her Sister in Reusch. I saw my relatives again after a long time. My brother-in-law Gunder (?’) looks proportional good with his 82 years. With a daughter of my sister-in-law Geissendorfer, who is married to a man named Schumann in Reusch, I stayed over night. From Reusch I went to Ippesheim, where I stayed with M. Herrmann. I visited my old friends and afterwards I went to Gallhofen and Rakenlohr and visited all acquaintances and preached the Gospel to them as good as I could. I didn’t think that there are so many people who had never heard about Mormonism. M. Herrmannn, Gg. Serbi and two girls from my brother-in-law were interested about the Gospel. On August 25th I went back to Nuremberg. In Ippesheim I registered for my stay. On August 30th. I was in Fuerth with Brother Habermann where I was invited for dinner. In the evening we had a Bible hour (meeting) here in Nuremberg and from here we went to Sister Baer, who doesn’t feel good, and administered to her. She has a baby. Today, September 1. Gg. Friedrich Kohles was buried. He died August 30. September 3rd We had 5 meetings. The evening meeting was well attended by friends. In the fast meeting Brother Piclo and myself blessed the child of Sister Baer and it received the name Dorothea Baer. We had a very good time there. September 12th. Today I have to report a great joy. I received from my good wife a package. In it was: 6 cans of milk, sugar, one box crackers, candy, one dollar and 50 cents, a beautiful shirt, and a tie, I was very happy about it and also happy, Sister Fetzer let me know, she will send a full basket of clothing for our children at Christmas celebration, God helps all the time again. Today the 23rd of September, we buried in Fuerth, Brother Ernsberger’s sister, Mrs. Beck. She wanted to be baptized, but got ill and died without being baptized. Brother Hans Schmidt and Brother Hofmann were the speakers at the grave and I dedicated the grave. The choir sang two songs. September 25th. We rode to Frankfurt, where a Missionary Meeting was held, President Balif and President Stoof and all the Missionaries of Frankfurt were present. On September 26. We had a meeting from 2:00 P.M. until 6:l5 P.M. and received good instructions and admonitions from the Presidents. In the evening 7:30 was a big meeting for members and friends which was very well attended. On September 27. I stayed with Brother and Sister Gg. Schloer, Franken Allee 59. Here they Congratulated me on my Birthday. I received delicious pastry and Dinner. On the 25th, I stayed over night with the family Wolfermann, Spahr Street 33- Besides I visited Elise Walz, who is married to a certain Mr. Wuenschbach, a Jew, and lives in Finkenhof Street 28. We had good weather and a pleasant time. On the 28th. In the evening we rode back to Nuremberg again. By Gemuenden happened a big Train Accident and we saw many smashed train wagon (cars) and freight railroad wagon and had a delay of some hours till the rail road was cleared and we could pass. President Stoof rode with us to Nuremberg. On September 29th. I visited together with Brother Stoof, some of my investigator families, which will get baptized in the near future. On September 30. We had early in the morning 8:30 A.M. a small Missionary meeting with Brother and Sister Hofmann, KoernerStreet, where I was asked to ordain Brother E. Otto Holstein an Elder. October 1. Was Fast meeting. We had five meetings. Brother Stoof was in Fuerth in the morning, and in the afternoon in Nuremberg, where he was present in the Priesthood meeting and Sacrament meeting. After the meeting, two brothers got ordained. Brother F. Georg Leupold became a Priest and Brother Bayerlein a Teacher. I ordained Brother Leupold and Brother Bayerlein was ordained by Brother Holstein. On September 30th, we celebrated my Birthday with my landlord Hefner. They had baked and cooked a lot of food. Brother Stoof, myself, and my landlord’s family had a good time. On October 3rd We had here in Nuremberg 18 Baptisms. They were performed in “Wild-Swimming pool”. Ten friends from Fuerth which were baptized by Brother Otterson and eight friends were from Nuremberg: Marie Walter Regina Schneider Babetta Walter Grethe Walter Elise Walter Elise Anna Walter Babatta Maria Zader Anna Katharina Eysser which I baptized I confirmed Marie Walter and Elise Anna Walter. We had a very good blessed time and many friends and members were present. And I am very grateful to my Heavenly Father for the great mercy I received that I may work in His Gospel. October 4th was my 20th anniversary of my baptism and I was in Fuerth where I was baptized 20 years ago. Brother Habermann invited me and we had a good time together. In the Evening I went to the Bible Hour in Fuerth and I liked it very much. October 5 I received a big package from my Anna which gave me great joy. Everything are Blessings of the Lord. October 16. We had Relief Society, Two sisters were urged to come, Sister Amon and Sister Seykauf. Sister Amon claimed that Sister Seykauf did steal about 600 Mark from her. She surprised her when Sister Seykauf was busy with her purse. But Sister Seykauf denied it and threatened to leave the Church. Her excommunication was granted. November 1. President Stoof was the Brethren and afterwards 7:15 a main meeting (like Sacrament Meeting). There were three branches, Nuremberg, West-Moegeldorf and Fuerth were present. Prosident Stoof gave us once more some good instructions and mentioned afterwards that this is his last meeting as Presiding Conference President because he will soon be released. Afterwards all the missionaries gave a speech, Brother Gardner spoke as successor of Brother Stoof, then Wendel, Brother Otteson, Brother Bigolow, then the three Branch Presidents, Holstein, Hofmann, and Weiss. After the meeting four Brethren from the Moegeldorfer Branch were ordained as Deacons. Brother Kuefner, Weiss, Loscher and Strecker. Brother Schwemmer from Nueremberg was ordained also. The Hefner family were present too, as friends. November 4. Missionary meeting at Brother and Sister Hofmann. November 20 and 21. In Munich my Passport was extended. On December 23. my Mina and Otto arrived here in Nuremberg. On the 26th, we went to the Christmas celebration in the Tulnau Hall. It was everywhere real nice. On December 27th, we both went to Stuttgart where a Missionary Conference was held. We stayed with Brother Mueller over night and also with the Hald family, who are good people. On December 30th in the evening my Mina went by train to Meissen. JANUARY 1923 On the 13th, 14th, and 15th. Conference in Frankfurt. Saturday Priesthood meeting from 7:00 until 9:30 (probably evening). Sunday, Sunday School from l0:00 until 12:00. Afternoon from 2:00 P.M. until 4:00 P.M. Meeting. Evening from 8:00 P.M. until l0:00 P.M. Meeting on Monday from 9:00 A.M. until 11:30 A.M. Missionary Meeting, then from 2:30 P.M. until 7:00 P.M. another Missionary Meeting. On the l6th. at noon we went back home by train. On the 23rd, Bible Hour in Hammer with Brother Schobert, with Heinrich Weis we ate and had Bible hour. On January 28, I went to Meissen. My Mina was a little ill with influenza but she recovered again. In Meissen we were invited on the 29th by several friends; Zinka, Backer, Koehler. On January 30, we went by train to Freiberg, passing through Dresden, and visited Hugo Mauermann’s relatives. We found there much poverty. On the 31st, we went to Chemnitz and visited there the relatives. In the evening we attended Bible Hour, which was well attended and we liked it very much. On February 1, I went back to Nuremberg and by train I passed through Hof and Bayreuth and arrived in Nuremberg at night 1:00 A.M. Mina went back to Meissen. I had some difficulties with my train ride. The Conductor said to me I should transfer in Hof, but I went naturally in good moods till Pirk. There a Conductor said to me, I should have transferred in Plauen. Then I rode two Stations back to Plauen and had to pay fair once more. From Plauen I went to Hof where I transferred again, came through Bayreuth to Nuremberg. The Railroad Company had several Trains restricted and also the Express train, because of occupation of the Ruhr Area by France, the coal is quite limited. On February 6, I went to Ippesheim where I was expected by my relatives and was well received. I stayed over night with Karl Almoslechner, and the second night with his sister Wiesen. The Mayor by name of Doeller went with me to the City Hall in Uffenheim, where the District Official read to me, that a new law is effective since January 11, 1923. All Foreigners in the City or County have to be treated equal and a three week’s stay permit will be 35,000 Mark, more than three weeks till two months will cost 70,000 Mark. I induced my leave. On the 12th of February, I received a letter from Anna, she informed me about a prescription for Gallstones. On the I5th of February. I went early in the morning to Wuerzburg and from Sanitaetsrat Dr. Sprins, I received the prescription. I sent it to the drug store (Schwanenapotheke) to Steinbuehl with a letter and was able to receive the medicine. The medicine expenses were 750 Mark, the Doctor expenses were 3,000 Mark and the train expense was 1,680 Mark. On February 16, we went to Berlin by train. There was a great conference. Apostle (David 0.) McKay was present. From the German Mission there were 207 Elders present. We had on February 17th a Missionary Meeting from 9:00 o’clock A.M. until 5:00 o’clock P.M., Everyone was called on to speak. On Sunday, February 18, we had meetings, Sunday School at 10:00 A.M. and so on! Saturday we had another evening meeting from 7:30 until 9:30 P.M. Sunday afternoon there was a general meeting from 2:30 until 6:00 and in the evening from 7:00 until 9:00 P.M. another meeting was held. MISSION JOURNAL CONTINUED: My wife was present, she came alone from Meissen, also our son Otto was here, he works in Stettin. We had dinner in a restaurant Sunday together with Brother Kraemer, Brother Hirschmann from Wien and Brother Mauermann. In the evening I lodged in a Hotel with my wife and several Brothers. Most of the brethren lodged in the hotel. On Monday, my wife and I went to Lauchhammer where we stayed over night with brother-in-law Kamprathen, and were welcomed very friendly there. I saw here big manufacturers and a Priket (brown coal) factory. The brown coal is laying openly and maybe only 3 feet deep is cleared and then the coal is ready for processing; it gets ground up and then is pressed into the form of a Priket (which is about 12 inches long, 4 inches wide and about 6 inches high). On February 20th, we went by train to Meissen, where my wife stayed with her sister. February 22, I went by train back to Nuremberg again and arrived here safely in the morning at 9:00 o’clock. All expenses must have been about 70,000 Mark, February 24. I registered my stay in Nuremberg for three months and had to pay a fee of 210,100 Mark. They told me that I couldn’t do any more Mission Work. Today. March 8th, the 3 month old daughter of the Kail family, living in Zirkelschmiedsgasse was buried. The father of the child is a member of the church, but the baby was not blessed by our Church. Our choir sang 2 songs, Brother Waldhaus gave a speech and I dedicated the grave. Friday, March 9. Brother Schoberth, Brother Waldhaus and myself were invited to a wedding by Brother and Sister Hofmann. The son, Hans Hofmann married Sister Olga Kail, There were about 30 persons present, good dinner, music and dance and we had a good time. March 13 Brother Schobert is ill. I conducted the Bible Hour in the home of Brother and Sister Adelmann. On March 17 we had a celebration and Bazaar in Relief Society (I guess a Birthday Party of the Relief Society organized in 1842). It was held in the Bucherstrasse. There were several members from Fuerth and many friends present. It was pretty well attended. We had a good time. Many handmade items were displayed which the Relief Society had made and were selling. The proceeds were more than 97,000 Mark. Besides a good program was also presented. On March 19. we had missionary conference in Stuttgart. Brothers Schobert, Waldhaus, Otterson and Brother Barri from Fuerth and myself went by train 8:30 from here and arrived in Stuttgart 1:00 P.M. We went right away to the meeting house. There we got a meal, afterwards was meeting held until 6:00 P.M. Then we went back to the Railroad Station, but we were too late. I went back to the meeting house and the Brethren Hamon and Braun went with me to Sister Christina Scholl, Schloss Strasse 57 first floor. I was welcomed here and stayed over night. In the morning at 6:30 we went by train. 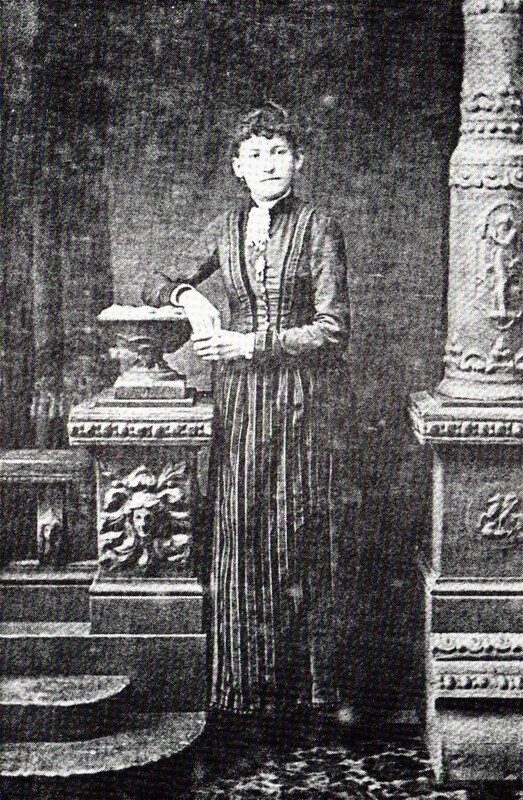 On March 26, Brother Schoberth, Brother Otterson and myself administered to a friend by the name of Wilhelmine Carl, rossweidenmuehl No.31 Room 19, who has been ill for ten years already and cannot do anything and presumably was possessed by spirits. On March 27. my Mina arrived from Meissen and March 28. we went by train to Wasserberndorf. We stayed here until the 2nd of April and then returned to Nuremberg. We received one round loaf of bread from G. Senft and sausage and eggs, which we shared with Hefners. April 7. I didn’t sleep very good last night, woke up at 2:00 o’clock in the morning. I ate in the evening one bowl of soup and two soft boiled eggs. On April .15. We had a beautiful meeting in “Goldenen Schwan” ( a room in a Restaurant). The Sunday School got re-organized. 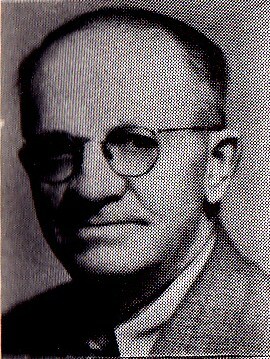 Brother Huinrich Weiss as Superintendent was set apart by Brother Schobert. Brother Johann Leipold as first counselor was set apart by me, and Brother Willeithner as second counselor was set apart by Carl Weiss. April 24. One day missionary meeting in Stuttgart. May 10th. Mother and I went to Eichstaedt to visit Mrs. Fetzer, Friedhofstrasse 54. We were welcomed very well. 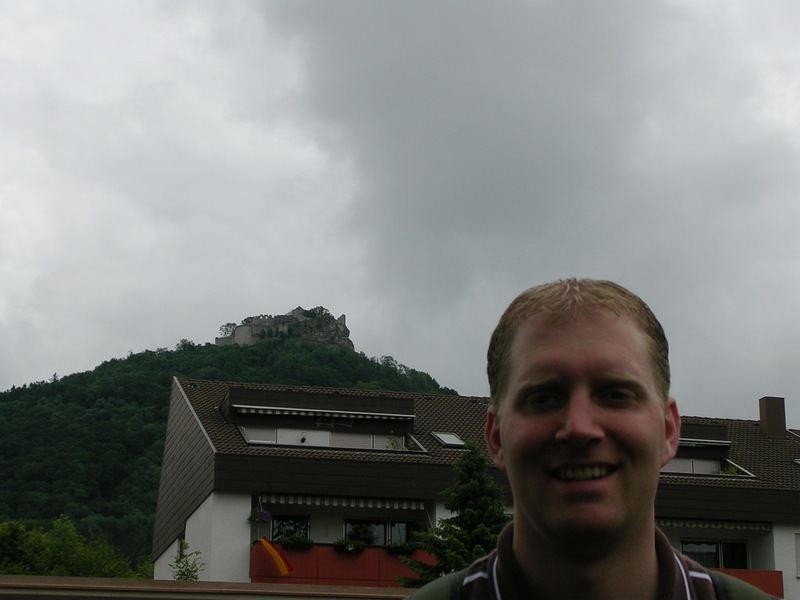 Eichstaedt is a city with 3,000 Population, the majority is Catholic, and is surrounded by mountains. We visited several churches to look at, and in the Walburga, Church there is an Alter, the bones of the corpse of the holy Walburga rested in a tomb like place covered with stone plates. I was told, nobody could enter the tomblike place. The stone plates develop a moisture (caused from heat in the tomb) which they catch in containers and is used as holy Walburga oil. It is said the oil has a great healing power. There are many pictures which indicate the great healing power in miracles. Today, May 12, Mother went to Kaubenheim. May 19. We both went by train to Windsheim. In Neustadt, we had five hours delay, and we reached Windsheim at 10:00 o’clock. We stayed in Windsheim over night and had a good lodging for 2,800 Mark. Penecost Sunday, we went to Buchhoim, Monday to Rudolshofen, where we were welcomed. Tuesday we left by train from Ermetzhofen where Georg Streckfuss accompanied us to Hernbergtheim, from there we went to Ippesheim and we were made welcome by Wiessner, Herrmann and Almoslechner. On May 23 we went back again to Nuremberg. On May 24 in the evening 8:OO o’clock, we had baptisms in Wildbad. The following people were baptized: Georg Walther, Simon Genthner, Miss Seiferth, Luise Seiferth, Miss Haeberlein, Mrs. Genthner and Mrs. Grauf. Brother Schoborth executed the baptisms and I blessed the baptismal water. I confirmed Brother Genther and Sister Luise Seiferth, Brother Schoberth confirmed Brother Walther and Sister Haeberlcin, Brother Sinsul confirmed Sister_____________ Brother Kufner confirmed Sister______________ May 28. I went to Wasserberndorf and registered there, made several visits in town and attended a war monument dedication in the Churchyard of Hohn in Berg for the dead soldiers from 1914 until 1918. June 3. We had Fast meeting, from 8:30 in the morning until 4:00 P.M. we had meetings. Brother Binder got ordained a Priest by J.W. Me. On June 4. I went to Munich and had my Passport extended for six months. I had no good time there, it rained all the time. I visited the Hofkirche (famous Church in Munich), the Hofbrauhaus, the Art Museum and several other places. June 9 until June 12. Conference in Stuttgart. I stayed with a Hald family, StrohbergStrasse 36, third floor, where I was made very welcome. I had a good bed and very good meals. Sunday morning I went on a walk with Mr. Hald. Tuesday, he accompanied me to the railroad station. Sunday, we had Sunday School, Priesthood meeting and in the evening Sacrament Meeting. Monday, we had from 9:00 A.M. until 1:00 P.M. and from 3:00 P.M. until 5:00 P.M. Missionary meetings. Tuesday at noon, I arrived again in Nuremberg. With Brother Schoberth, I made some visits and in the evening we went to Hammer, where we had a small cottage meeting with the Weiss Family. Wednesday and Thursday, I didn’t feel very good and stayed in bed. Friday, the 15th of June, I got up again and made several visits with Mina. The weather is always very cold and rainy. June 21. I am ill and Minna is sick too, she has a rash on her face for eight days already, July 1st. Fast meeting, Sunday School in the forest near Klettschen Fabrik. Brother Otto Baer was ordained a Deacon by me in the Bucherstrasse, July 1, 1923. On July 9. Sister Haeberlein was set apart a teacher in the children’s class by me in the “Goldenen Schwan” (Resturant). On July 25. Mina and I visited Brother Habermann in Fuerth. Afterwards, we went to the Klein family, where we had a good time. In the evening, we visited Brother and Sister Schneider and then we went to the Bible Hour where I received my release from Brother Erdil. On the 27th. I visited with my Minna and several friends in Johan’s ——-. In the evening 5:00 o’clock, we went by train to Roethenbach, where we had a Bible hour (cottage meeting) with the Hahn Family. Brother Schugk gave the lesson. It was the third time I was in Roethenbach for the Bible hour. 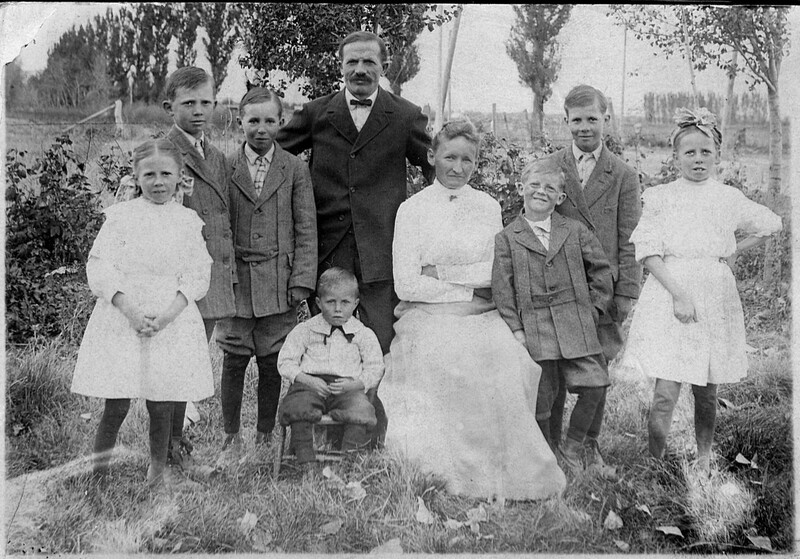 When we returned home at 9:00 o’clock in the evening, Brother Hofmann and myself went to Fuerth where we administered to Brother and Sister Plesol’s two children age one and one-fourth, and three years old. They were very ill. One o’clock in the morning we returned back home. On July 31, We had 16 baptisms in the “Wildbad”. I baptized seven persons and Brother Schoberth baptized nine persons: M. Wilhelm Baer from Roethenbach Babetha Geist From Roethenbach Konrad Geist from Roethenbach Hahn from Roethenbach Frieda Naehr from Nuremberg Michael Oberseider from Nuremberg Margaretha Weis from Nuremberg Those are the persons I baptized. Anna Geist from Roethenbach Kunigunda Geist from Roethenbach Walburga Hahn from Roethenbach M. Margaretha Hofmann from Nuremberg Johanna Gak from Nuremberg Cristonsia Gak from Nuremberg V. Franz Stiller from Nuremberg Helena A. Stiller from Nuremberg Those are the persons Brother Schoberth baptized. *Angela Stiller from Nuremberg Page 46 was left blank. On August 1, Our Otto came to visit us from Landsborg and we went to Fuerth to Brother Habermann’s home and had dinner at noon. August 2. We visited the Naehr family, afterwards we visited Otto. Brothers Schoberth, Kanfild and myself then viewed the Klettsche Fabric (Plant). August 3. We, Minna, Otto and I went to Streitberg and Muggendorf, where in Streitberg, we visited the Bing-Cave. The cave is 396 meters long and 70 meters under ground level and very interesting, because of its drop formations. On August 12, We had a meeting in Erlenstegen in the forest and there we took a branch photograph. Last Friday, we had a Farewell meeting for me and for Brother Schoberth, who went then to Breslau as Conference-President. August 19. I received word from Leonard, he paid for the (Schips ticket) Ship’s ticket, American Line, for Mother and F. Naehr. August 24. was farewell for Brother Dotzler, who received a Mission Call. August 28. We had in Nuremberg, a wonderful conference. The mission President, Brother Tadge was here and Brother Hueckert, from Fuerth, who is now released, was the first speaker, followed by Brother Erdli, Conference-President, and Brother Tadge was the last speaker. Brother Mueller conducted the meeting. There were more than 300 persons present. A great part of the attendance were investigators (friends). On August 27. Conference was in Fuerth. There were 400 persons present. On August 29 We went with Frieda Naehr to Munich, American Embassy (Consulate) to obtain a Visa for Frieda. We have no idea yet, when we can leave here. On September 2, I was with my Mina in Fuerth, attending Fast meeting and afterwards visited Sister Igelhaud and the families of Klein and Goissler. On September 14. Brother Canfild, Brother Cunningham and myself administered to Sister Leupold. She has (Ischias) like Arthritis, and is in great pain. On September 15. We arrived by the Hefners and had a good dinner and supper. On September 16, I blessed the oil in Sunday School (consecrated the oil). After Sacrament Meeting, Brother Canfild, Brother Sus, Brother Mueller and myself blessed the child of Brother and Sister Baer, which was born August 30, 1923, and gave it the name of Otto. I administered the blessing. On September 17 at 9:00 o’clock in the morning, my Minna went by train to Meissen to say “Good bye” to her relatives. On September 18. I went by train to Neustadt and visited there an old friend by the name of Vogel (Liessweth) (I guess Liessbeth), whom I hadn’t seen for about 33 years. Then I went by train to Windsheim and then to Buchheim, where I stayed for three days by Georg Streckfuss. They gave me a warm welcome. From here, I went by train, with Johan to Ermetzhofen and visited Mrs.______ Donner, who told me all about her suffering, but she was happy to see me. She went with me to Rudolshofen, where we visited my Brother-in-law Streckfuss. But I was not welcome here. The old ones and the young ones had a quarrel and Brother-in-law H. Georg said it would be the best for us to leave at once, because he cannot accommodate me, and the young ones would look upon me like a pig in a Jew court yard. It was raining real hard at this time, and so I stayed until the rain got less; and then I left without shaking the hands of the young ones. In the night I reached Uffenheim and went to the Busch family. His wife is a twin sister to Reuscher Gundel. They gave me a warm welcome and they were happy I visited them. Here I stayed overnight and in the morning I went to Gallhofen and I visited first the Serbin family. They were just butchering a pig. I didn’t go in the house, said “Good bye”, and went to the Herbst Family, who married the youngest daughter of Gundel. But they had not much time for me. Then I went away and walked in the Street. It was raining a lot and I opened up my umbrella and walked without turning around. It was one and one-half hours until I reached Oberruekelsheim. I had to turn around and walk half way back. After half an hour’s walk on a very dirty road I reached Herrnbergtheim and then to Ippesheim, where in the evening I reached cousin Wiessnar, very tired and stayed overnight. They gave me a very warm welcome. I stayed here until September 25th. There was an American visiting with his wife, who came from Wienna (Vienna). They visited his parents. We had a good conversation together. On Sunday, he traveled back home to New York. Sunday I attended a funeral and Tuesday I went to Reusch and visited Brother-in-law Gundel. Here I met a son of the Busch Family, who is enrolled in the Technical College in Nuremberg. Then I went to W. Geissendorfer and her daughter, who is married to a certain________________ in Reusch. Then I went back to Ippesheim and from there bo Herrnbergtheim. From here I went back home by train to Nuremberg, and arrived in the evening at 8:00 o’clock. On September 27, My Birthday, I was invited at noon by the Hefners and in the evening for Dinner by Brother and Sister Schneider. Later on at 9:00 o’clock in the evening came all the choir members and youth and gave a serenade of three songs “Befehl Du Deine Wege” – “Trust Your Ways In The Lord” “Du Was Ist Recht” – “Do What Is Right” and “Nocheinmal Will Ich Singen” – “Once More I Will Sing”. It made me very happy. October 4, 1923. My Minna came back from Meissen. On Friday, we went by train to Helmmitzheim and from there to Ziegenbach to Georg Wendel. They gave us a warm welcome and we stayed over night. The other day, Saturday, we went to Wasserberndorf. We arrived there in the evening. I gave notice of my leaving at the Registrar, and we visited several friends and stayed over night with the Rodammer’s. Next day at noon we went back to Nuremberg again by train. On October 9, We left Nuremberg by train at 2:30 P.M. Anna Herold helped us carrying our small luggage to the Railroad Station. The Elders and several members and Sister Naehr accompanied us to the platform. There they wanted to give me a helping hand, but I refused. We rode then all night thru and arrived in Hamburg in the morning. There we came to the emigration building and stayed in one room with other people like a herd of sheep. One after another got called out and the emigration papers brought in order. Our turn was finally at 4:00 P. M. The other day we got vaccinated and that lasted almost all the day long because all the passengers for three ships were all together. On the 12 of October, we all had a physical examination by an American Doctor. It lasted until noon. In the afternoon, we went into town for a little while. There are three mealtimes: at 8:00 A.M., 12:00 Noon, and 5:00 P.M. The food is good and enough of it. But the quarters I cannot praise. In our hall are forty-eight beds. The beds are very hard and cold. Men and women are separated and also the different races. With me, there are only Germans. There are four halls in those quarters. The Poles and the Jews are by themselves. October 13. We all had to gather and then we received our Passports. Afterwards several formalities were settled and 12:00 o’clock, after we received a good bread and a piece of sausage from the barracks, we entered the ship. The bigger luggage was transported, the small ones we had to carry. From this ship, we all were transported to a Hall, where again, we got treated like a herd of sheep. Here again, several formalities were settled. Then, we were transferred again to another ship, which took us, after showing our papers, to the huge ship “Bayern”, which was pretty far away in the ocean. Here one had to show the passport to a German Officer, who put a seal on, and then one was allowed to enter the ship. We had difficulties. When our turn came, the officer put our Passports aside and said, we have to wait, probably to wait for the next ship, because we have not paid the consumption tax. Mina got real mad and scolded the Officer. The Officer said cold-hearted, “What will you do when I don’t let you go? It is the Americans fault that we have a bad life.” She gave him a Dollar and after the Captain from the ship came, we paid the consumption tax 240,000,000 Million Mark, he let us go. When we were on the Ship and got our cabin, the dining room, served coffey and cake. I have cabin No. 100 and Mina and Frieda have No. 58. In my cabin, there are 14 beds, and in Minna’s are 4 beds. In the evening was served goulash, potatoes, Tea, bread and butter. After the meal we had a concert. The mealtimes are arranged in three, one after another following divisions. We three are in the first division, at table No. 1 in front at the first chair. October 14. Morning. Today is Sunday. The morning is quite calm, some fine rain, but the sun is always shining again. It is a little windy. In the morning was served fried eggs, bread, butter, coffee and rolls. Many people are sea sick and have to feed the fish. Some had to get up during the night to go on Deck, even one man from my cabin, who is from Nuremberg ______________________(probably space for his name). We feel so far, pretty good. Only I think a lot back on Nuremberg. At 10:00 o’clock I went to bed, as I was tired. At Noon we had noodles, red cabbage, Roast with sauce and coffee. In the afternoon it was raining quite a bit. We were mostly alone in the room. We were together with a man from Saxony, Leipzig, by the name of _________________________he is 56 years old. In the evening they served Potato salad, sausage, and meat balls, Tea and butter and bread. October 15 Today, I slept very well, got up in the morning at 6:45 A.M. It is a beautiful morning. We went at once to the Deck. It is a little windy, but otherwise nice. The sun was a little hidden in the clouds when he came up, but then at once, it was a clear morning. Just now, we passed England and could see very close the English white coastline, like white rock. With the telescope, we could see English Towns and many fishing boats. For breakfast we had Coffee, Rolls, Hash (like fried cornbeef) delicate pickels and bread. It is a beautiful day today. The ocean seems so calm and the sun is shining so warm. Everybody Is on deck today. At noon we had pea soup, potatoes, lamb roast, sauce, green beans mixed with white beans, coffee and cake, bread and butter. After the meal, we saw at the English Coast seven English battleships maneuvering. Oh it is beautiful. Now I think of all those beloved ones we left behind in Germany, could they not be with us now? But it had to be farewell. At Noon, I had a conversation with a man from my cabin. He is from Berlin. He don’t think much about Religion, but was quite interested in the Gospel and wants to hear more about it. October 16. Today I saw a Sunset. It was a bright sky and splendid to see how the sun disappeared in the water (Ocean). He went down European time 6:20 until 6:25 P.M. Our supper was fried or baked fish, potato salad, Sausage, bread, butter and Tea. In the evening, 9:00 P.M. I went to bed. October l6.(?) The morning is beautiful. The Ocean is smooth like a mirror. I feel good, Breakfast Coffee, Rolls, Meatballs, butter and bread, Potatoes, and Schelle? Noon meal at l:00 P.M. Hamburg, Germany time: Potatoes boiled, beefbreast with Kohlrabi (German vegetable) cut in little squares, soup and coffee. The afternoon is a little windy. Now we are a short distance out of the Channel (between England and France). The time difference is one hour and 10 minutes. Evening meal: Potatoes, white cabbage, beef meat, bread, butter, cheese and tea. The Ocean is a little restless. The sunset was very beautiful from 7:50 until 7:55 P.M. Hamburg time. October 17. This morning is very gloomy weather. The Ocean is still pretty calm. Breakfast: Rice, Macaroni with meat, coffee, bread with butter, I feel quite good. At noon: bread, peas, mash with meat, coffee, rolls, butter, meatsauce, potatoes, and pudding. Evening: Potatoes with beefbreast, sauce, coffee, bread, butter and pudding. October 18. In the morning, I slept well, feel good, the weather is a little stormy and some rain. Breakfast: eggs fried with potatoes, coffee, bread, butter, and wek? The weather is very windy. The water splashed to the Deck. Noon Meal: Soup, potatoes, white cabbage, beefmeat, sauce, butter, bread, coffee, and cake. Afternoon sleep. The wind is pretty strong and the water always uplashes over the rail. Evening Meal: Ricemash with meat, frank furter Liverwurst, bread, butter, tea. I have not a good appetite. October 19, slept good. The weather is gloomy and unfriendly. Breakfast: fried meat, potatoes, rolls, butter, I didn’t eat much. Noon Meal: Vegetable soup with sausage, potatoes, fish marinated with sauce, coffee and pudding. The weather is windy. October 20. The weather is windy and gloomy. I layed down all day long. I have a temperature from my vaccination, evening meal: I ate herring (fish) and potatoes and went right after in bed again. Pain at the bladder. October 21. In the morning the weather was rainy, later on it cleared up. Breakfast: fried eggs, coffee. Noon Meal: noodles with chicken soup, boiled chicken with sauce, rice, sweet rolls and coffee. At Evening Meal: Potatoes with sauce, Livercheese sausage, butter, coffee and bread. Afterwards there was a program in the Dining Hall, it was decorated. Several plays and productions were presented. I went to the Doctor, too. He bandaged my arm which is inflamed. I have pain. October 22. I got up early and feel a little better. The weather is rainy and gloomy. In the night the Foghorn made noise every few minutes. Breakfast: mashed potatoes with cornbeef, pickles, coffee, rolls, butter, and one apple. Mina is not feeling well. Noon Meal: Potatoes, beef stew-roast, beets, sauce, noodles with vanilla and Coffee. The Ocean is wonderfully calm, but the fog is all around us. The foghorns shake the air uninterrupted. Mina is not feeling well. Evening mealt Rice, sauce, canned meat, tea, bread, and butter. October 23. In the morning rainy. The Ocean is calm, the fog is decreasing. Mina is still sick . The Doctor gave her some medicine. My appetite is not big, but I feel good. Breakfast: Meatballs with sauce, coffee, bread, butter and raisins, Noon Meal: red cabbage with porkmeat, potatoes, sauce, and Coffee. Today I took up a collection for the Steward, but didn’t got very much, Mina is up again. October 24. It is Mina’s Birthday, She feels a little bettor. Breakfast: Porkchops, one Apple, Coffee, rolls, butter, and jelly. After the meal we were all counted. Then we went on Deck, It is beautiful weather. The sun is shining warm and the Ocean is beautiful, beautiful mirrored in the sunlight. We stayed mostly on Deck. Supper: Soup with Livermeatballs, Sausage, Rolls, butter, and pudding with vanilla. Afterwards, we went once more on Deck. It was a beautiful warm and bright night. October 25. In the morning 6:00 o’clock a tidal wave. One big wave came through our open port hole and flooded our cabin completely. It is raining and we have fog. Breakfast: coffee, two eggs, one apple, rolls, and butter. I have no appetite. Mina did not come for breakfast, she is in bed, I dreamed today about last Dec. 29 and 30th and about 2 Saturday and Sunday of February. October 26, I got up this morning at 5:00 o’clock. At 5:30 Coffee, and then I went to the Deck. When the sun came up, we could already see land. It is a glorious morning. The sun came out of the Ocean in blue-red color. After awhile, we could see many ships. About 7:00 o’clock the Pilot ship picked us up and the German flag was taken down. The American flag and the Mail Flag were put up. Afterwards, another boat came and picked up the mail, and the mail flag was taken down again. Then another little boat came with the Doctor on it. Now, once more, there was a physical examination. Men and women had to disrobe separately and walk in front of the Doctor. When I noticed that this procedure was not done thoroughly, I didn’t follow it. There is a lot to see all around us. The ship is standing still at this time. It is 9:00 o’clock in the morning, American time and 3:00 o’clock P.M. Nuremberg time. At noon, we had once more a meal on the ship, then the amusement started. First, the people from second class could leave the ship, after them all American citizens. We had to go to the Custom hall and go through all the struggle, because Frieda was with us. We were once more counted and had to go from one room to the other again, then back to the ship where all the luggage was and then we went to the Island. Here, we came to a big building where we had to run up and down stairways. Each time we were sent from one place to another. All the time, there were three or four men, who looked at us and searched through our belongings, and with everyone we had to show different papers (like ship release papers, emigration papers). One had to follow the correct procedures. But we could not leave before we got another certificate, because we had no ticket for further traveling. We had to go back to New York, to the American Express Company and get our money. And so, we were sent from one place to the other, until we had permission to travel to New York. We went with several “suffernden” companions back, and there we ended up in a big hall. Afterward, we went with three other people to a Hotel, where a bellhop showed us the way. We had to climb stairs again to the elevated railway. Soon we could not drag our luggage anymore. After we rode a distance, we had to travel by foot again to the hotel, “The New Hotel Keller” 385 West Street, New York City. We had a pretty good place with a comfortable bed, which was pleasant after all those exhaustions. We paid five Dollars for three persons without meals. On October 27. In the morning, I called President Roberts and Brother Ina was at the telephone. They sent a Missionary by the name of Carl B. Wever, 2825 Lincoln Ave., Ogden, who brought my ticket and our money, 200 Dollars, which was paid by the American Express Company. He helped us to get the two tickets for Mina, and Frieda. It cost $171.54 from New York City to Salt Lake City. We then went back once more to look after our basket luggage to get them to the railroad. Afterwards, we went again to the hotel and paid our bill and to eat something. Then we crossed the Street and entered a ship and went directly to the railroad Station. We did not have much time and left by train at 2:30 P.M. We had beautiful weather. October 28. Sunday, we arrived in Chicago at 6:00 o’clock P.M. and held a delay until midnight 12:00 o’clock. In a Restaurant, we strengthened us a little, and the rest of the time we stayed in the Railroad Station. It is the most beautiful Railroad Station, I have ever seen. October 29. Early in the morning (just past midnight) at 12:15 A, M. we left Chicago and arrived in Omaha (Nebraska) in the evening at 4:30 P.M. We had here a delay of 45 minutes. We had beautiful weather until we reached Council Bluff, then it started to snow violently. Now the train wagon (cars) starts to be shaky, so much so, that I can not write anymore, besides the ink is all gone, too. October 30. The sun got up really beautiful and bright and it is a sunny day. We came to Juliusburg. There is a little snow cover and it is very cold. Even though the sun is shining so warmly, icicles and snow are hanging on the train wagon. By 11:00 o’clock A.M. we reached Cheyenne, (Wyoming). Here, we had a delay until 2:25 P.M. We went sight-seeing at the Capitol and the Museum. We saw here much Indian-war-equipment and works. Also several German war-equipment from 1870 and from World War I from 1914 until 1918. Afterwards, we got some food. October 31 We arrived in Salt Lake City at 8:00 o’clock in the morning. Anna came with Loni to the Railroad Station and picked us up with the car. We went first to Fetters, where Leonard took Frieda home by car. Afterwards Loni drove us and Anna to her place, where we had a good meal. After that we went to Frieda, (probably Frieda Greaves— Mina’s daughter) then to Klara, then home to our paradise. END OF MISSION FINAL NOTE by typist Pearl Wendel: A call made to Otto Andra — At the time of the typing of this diary by Pearl Wendel in July 1978, it was revealed that Otto had been living in Preston, Idaho at the time Grandpa, John Wendel, received a Mission Call while living in Sugar House with Elder LeGrande Richards as his Bishop. Otto moved down to stay with Mina (Grandpa’s Second wife and Otto’s mother). 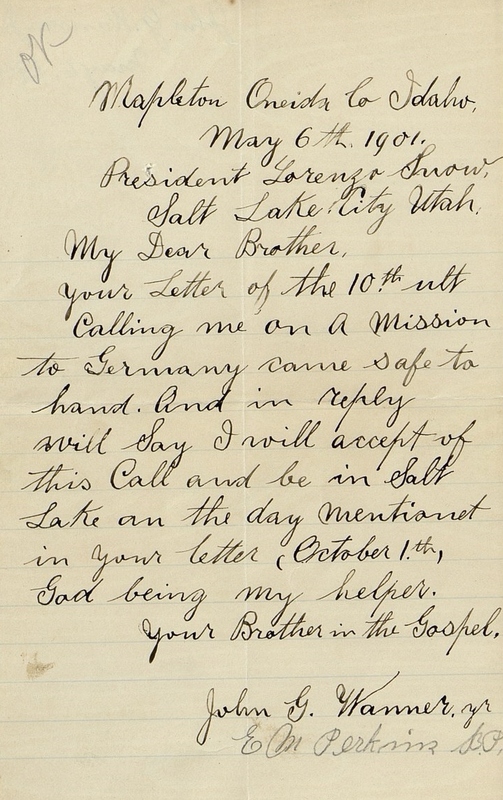 In November 1922, Bishop LeGrande Richards then had a call for Otto to go to Germany on a Mission. Otto informed him and he had come to take care of his mother while her husband filled a mission. Bishop Richards just suggested that he take Mina with him. Even though it did take them a little longer to get ready, Otto did accept his mission call and his mother went with him. Part of her time was then spent with Grandpa in visiting various places, relatives and conferences. The remainder of her time was spent in Meissen visiting her sister and other relatives. 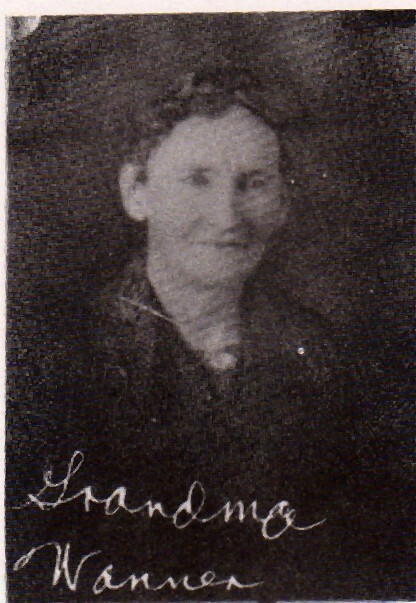 The Frieda Naehr who came home with Grandpa and Grandma Wendel was a niece to Frieda Johanna Neuner, who was the wife of Leonhardt (Leonard) Michael Wendel, the oldest son of Grandpa John Wendel. Yesterday President Dieter F Uchtdorf mentioned Dresden, the ancestral home of my Knauke family and ancestors. President Uchtdorf talked about the rebuilding of the Frauenkirche. He recalled a haunting childhood memory of dashing to a bomb shelter near Dresden when explosives dropped on his hometown. He then spoke of Dresden which was almost entirely destroyed by carpet bombing in World War II. One of the losses was the historic Lutheran Frauenkirche. The building was left in a pile of rubble from 1945 until the time for its reconstruction arrived in the early 1990s. The building was completed in about 2005. Amanda and I visited Dresden and only spent about a day there. I remembered hearing stories of the beauty of Dresden told by my Grandmother she had heard from her Grandmother, Christiana Wilhelmina Knauke Andra. 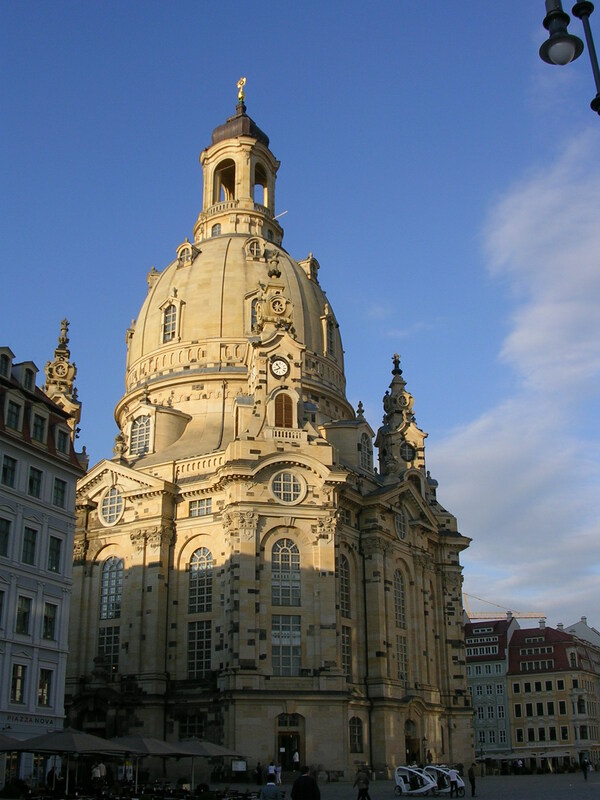 This Frauenkirche’s restoration was a highlight and the major must see site when we visited. 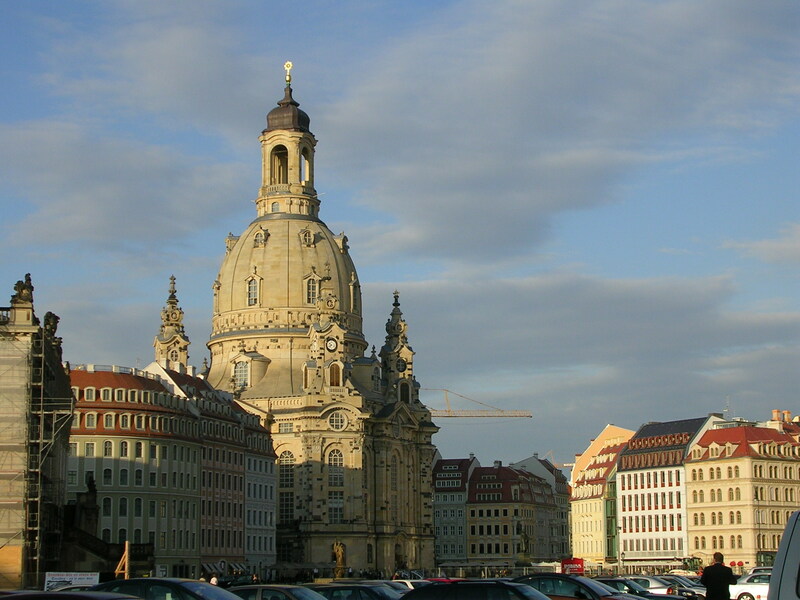 Here is a picture of the Frauenkirche provided to me by my sister Becky after her visit there in 2004. Amanda created this panorama from the other side of the River Elbe. You will have to click on it to really see it very well. The Frauenkirche is one of the two main churches visible in this picture. Lutheran on the left, the Katholische Hofkirche on the right. 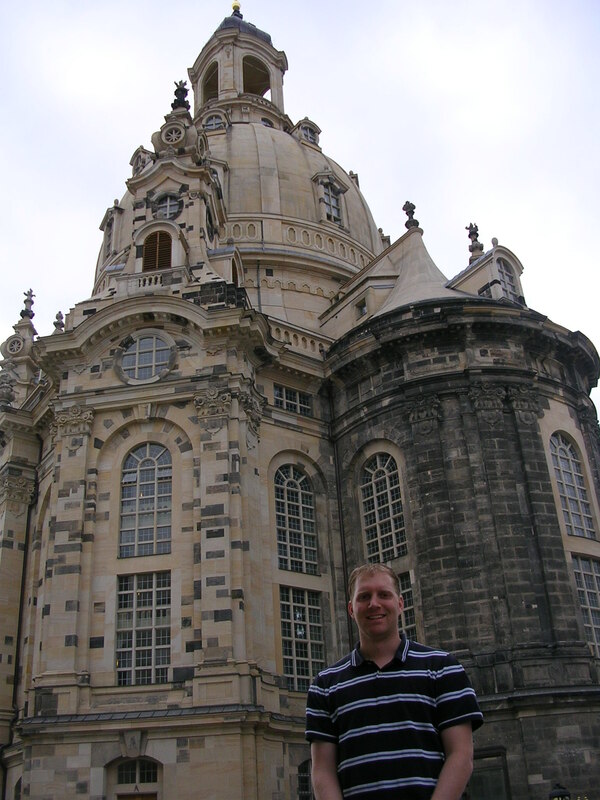 Here is my mug shot with Frauenkirche. Two more pictures we took that day. Amanda and I attended an organ concert in the building 11 June 2008. I don’t know what we were thinking, but we did not get a single picture inside of the building. We were up in one of the balconies, it was amazing. Some day I hope we are able to return. The beauty and architecture inside the building were beyond what I could have imagined. We also saw other rebuilt buildings in Dresden. 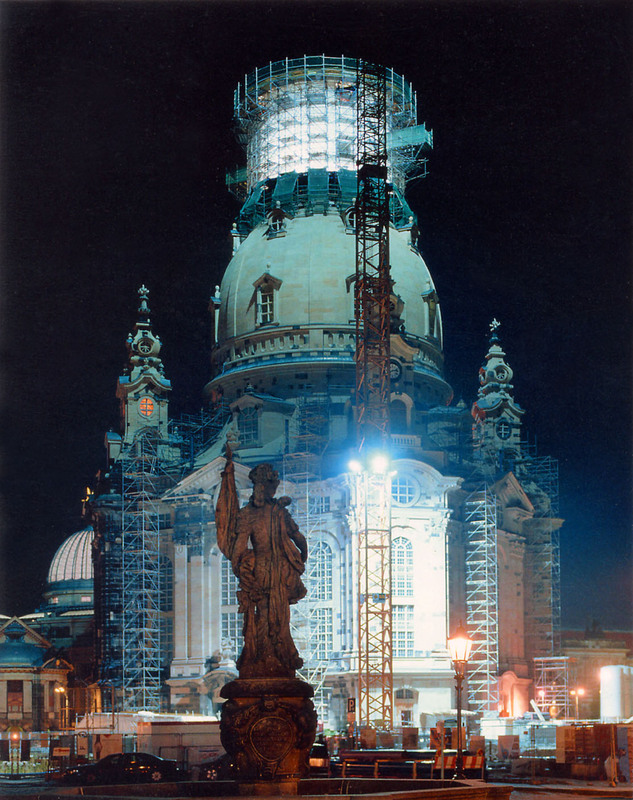 I quite liked the Zwinger Palace with its reconstruction completed about 1965. The Phoenix story of Dresden is moving in most of its details and timeline.